JEN would like to express our sincere appreciation to those who support our program in Niigata, Japan. 10 volunteers from a company visited Iketani. There were actually 4 repeaters in that group. It was really appreciated. Normally, most participants for Village Revitalization Volunteers had not met each other before because they participated by themselves or with a friend etc. On the other hand, the10 participants this time have in common as they were from the same company since they saw the notice of the volunteer recruitment and participated in the activity. However, they belonged to different department and were in different age group. “Oh, why you are here, sir?” A man could not help being surprised as his manager also joined in. “Hey, how have you been?” Manager talk to him too. The work and other matters during the stay such as cooking, room sharing and working group were fairly shared and organized for the 10 volunteers. As time goes by, even though there were still kind of hierarchy, they enthusiastically talked each other as they got together with same motivation. Some members of Tokamachi Regional Development Planning Committee and JEN staff joined the conversation. “How about having a company trip here?” “Why is the international corporation NGO engaging to village revitalization? ”, “What is the definition of “self reliance”?” ,“You are very fit　and energetic, man”. The conversation did not stop. 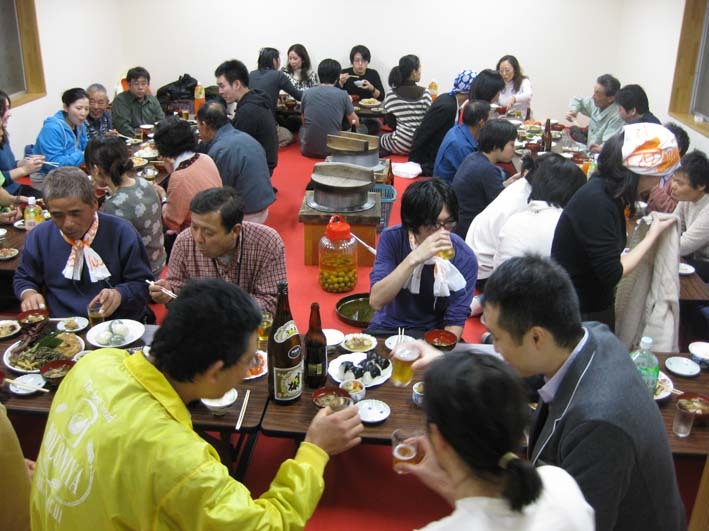 There is normally an integration banquet between the villagers and volunteers in village revitalization volunteer. However, there was no banquet that time as they had sports event in the region next day. There were many first time participants in the volunteer activities organized by JEN and the activities were in 6th year this year. On contrary, there were many repeaters too. We could see that the repeaters were advising to the first time volunteers. JEN will continue sending “village revitalization volunteers” as long as it is needed. Although you need lots of courage for the first step, please join us if you are interested in! Not only village revitalization volunteer, but also there is “Let’s Go to TAMBO!!”. Please feel free to contact us for further information. May is the busiest time in the year for seedling and soil preparation for rice planting , gathering wild vegetables and planting vegetables. Recently many people had begun visiting the village in weekends whether there was any event or not. The purposes for their visits were vary from volunteer for wild vegetables gathering and agriculture to photos taking. 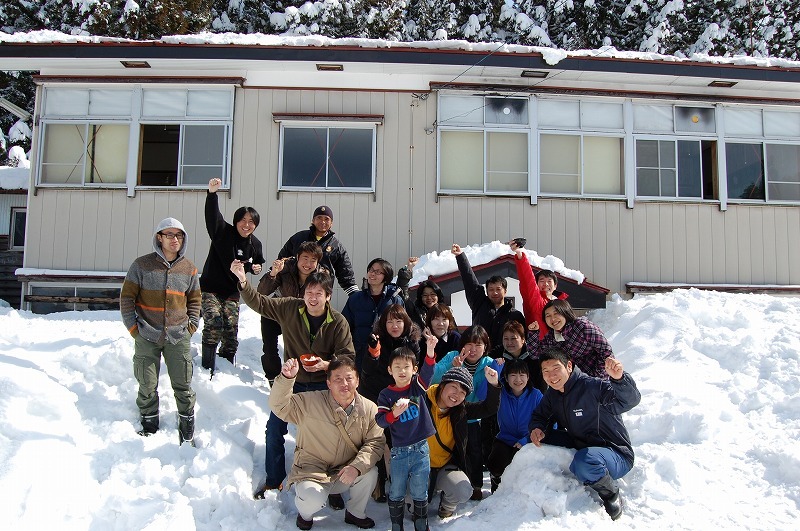 They stayed at Yama-no-manabiya, renovated by volunteers for the revival from earthquake , and changed their plan flexibly depending on the weather and villagers’ schedules. There were variety of ways for staying, such as “The villagers took them for wild vegetable gathering and they gave foot acupressure point massage to the villagers in return”, “They took photos and held a small photo exhibition then they invited the villagers to it” and “They receive some instructions for growing vegetables through helping agriculture”. They had been participants for “Village Revitalization Volunteer” or “Let’s Go to TAMBO” and they repeatedly visited the village. It seemed that each of them carried out “the things which they can help the village with their fun”. We felt that the elderly villagers gradually remembered the volunteers’ names and the category such as volunteers and recipients became unclear, then they were personally getting closer and closer. It’s that time of the year again! 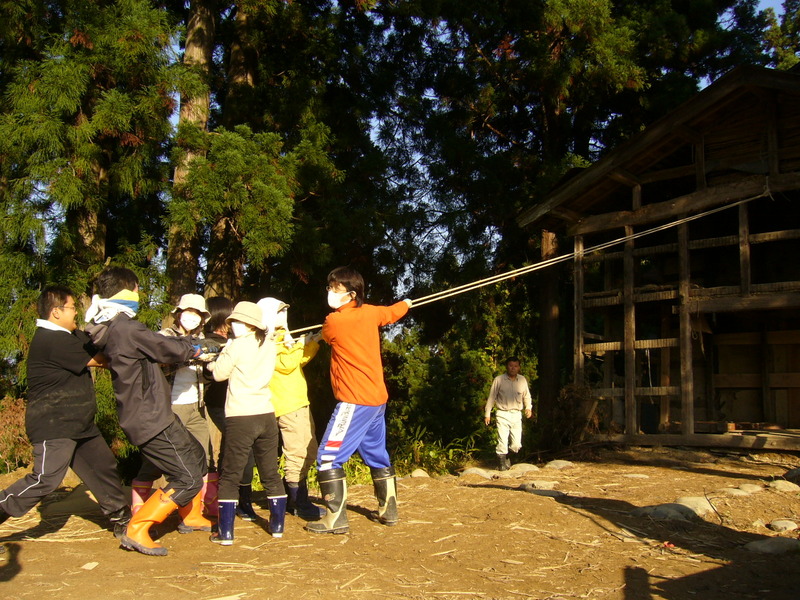 Let’s visit the village over a weekend and participate in some volunteering activities! 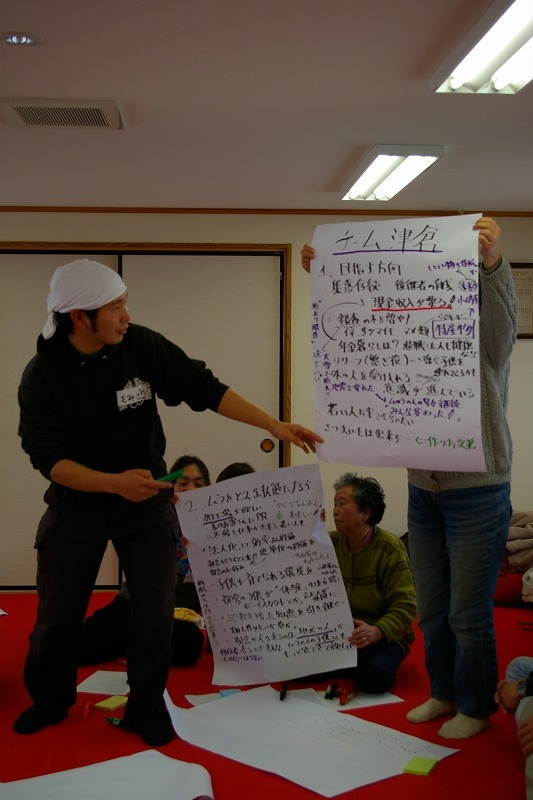 Ever since the Chuetsu Earthquake that hit Niigata Prefecture in October 2004, JEN has been assisting the Iketani and Iriyama villages (population: 13 people, 7 households) through organizing various volunteer events. Deadline: First come, first served basis. How to sign up: Please download the sign up sheet, and either fax it or email it to JEN. Registration is equally possible by telephone. This event is run in cooperation with Tokamachi City Regional Development Committee. Grateful for Each Person JEN Has Met. As JEN’s program in 2010 are going to get started, we will share some thoughts with you. In October 2004, the Chusetsu (Niigata Prefecture) Earthquake occurred. JEN dispatched some staff as a coordinator to Kawaguchi-cho, Tokamachi City, coordinate many volunteers from all over Japan. Then, JEN’s assistance started. 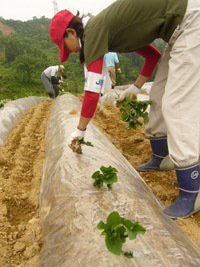 In the spring of 2005, JEN initiated the Agricultural Volunteer Activities. We got determined revitalize Iketani and Iriyama village where an unsustainable village comprised of only six households was and hideous scars by the earthquake remained. Slightly fewer than one hundred volunteers have been there and helped the villagers do farm chores and did the cleaning after the earthquake. 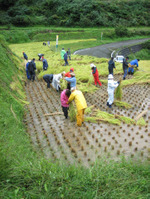 In the spring of 2006, the villagers planted rice two years after the earthquake. Since then, JEN has supported the system of direct selling of rice. Since around that time, we have found that some of the volunteers come to Iketani repeatedly. In the spring of 2007, JEN hoped to support the villagers, who want to increase output of rice. The volunteers and the staff at JEN strived to do so. In July, the Niigata Chuetsu Oki earthquake occurred. The locals in Iketani and Iriyama took the JEN’s staff to Kashiwazaki city and made efforts in order for us to take measures for the damages there. Additionally, they thoroughly supported the volunteers for Ohanashi-tai in which the volunteers, staying at the branch school in Iketani, researched what the elderly victims suffer from and took care of them. 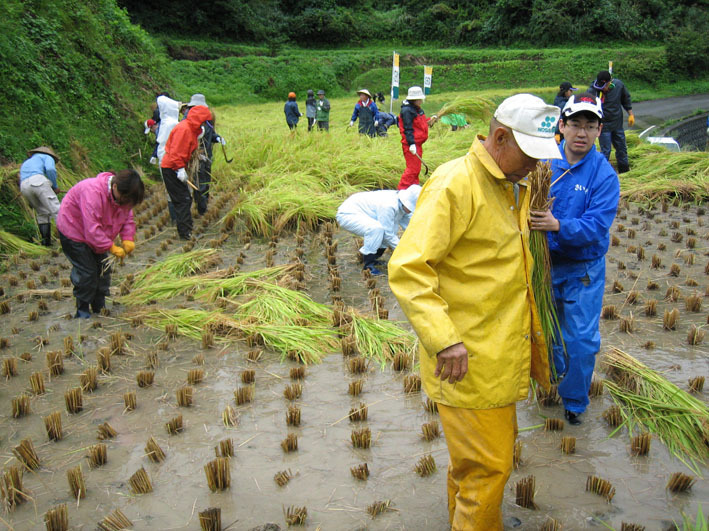 In the spring of 2008, the villagers taught the volunteers how to plant rice for the first time. As crop-planting experts, they supervised the new volunteers, and in some cases, they did so strictly. This year, JEN made a plan which revitalized the village. 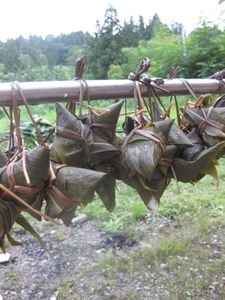 that the locals did “hazakake,” the way of drying rice ear in the sun. The place where rice was dried in the sun was higher than a roof. 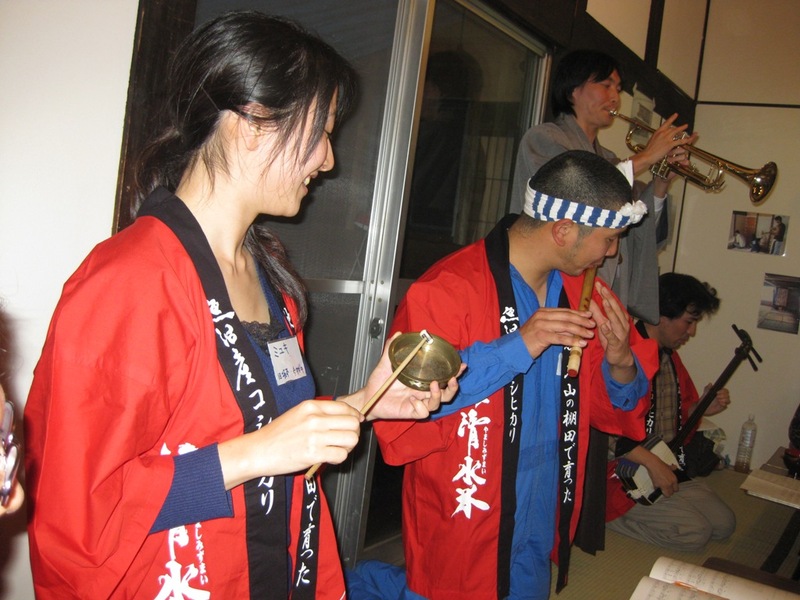 Also, the women in Iketani started cooking classes in local dishes, and everybody enjoyed a spectacular bon dance which was held for the first time in thirty years. Since the Tokamachi Regional Development Committee has voluntarily and proactively involved, JEN has been able to continue assistance in Niigata. What kind of surprises will happen in Iketani and Iriyama where more than seven hundred people have been? It is you that make change!! Hope to see you all in Niigata! 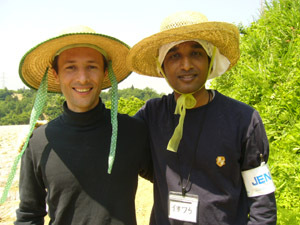 Ｅvery year, 200 volunteers visit Iketani through JEN. 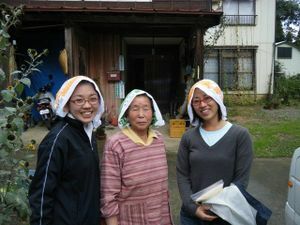 If we include people who visit privately, nearly 300 people continue to visit Iketani, a small village that consists of seven households and sixteen people. Without a doubt, the primary reason why the people continue to frequent the village is the villagers’ hospitality and easygoingness. Another reason is gigantic, strict, and formidable nature, which profoundly impresses us into realizing that we are also part of it. There is also the modest but delicious foods that fully exploit the original flavors of all the ingredients. And the tradition and customs that make us proud of being Japanese… the list could go on forever. Hiroshi Yamamoto, the chief representative of Tokamachi Regional Development Planning Committee, says he is trying to encourage visitors to take initiatives. We feel that taking initiative means seeking our possibilities on our own. 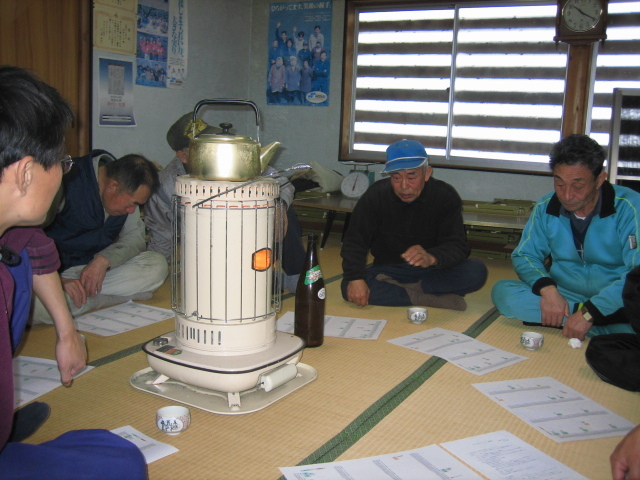 At the village get-together on March 20th, this year’s agenda regarding events in the Iketani Village was decided. JEN plans for this year’s village revitalization volunteer program according to the village’s agenda and needs. 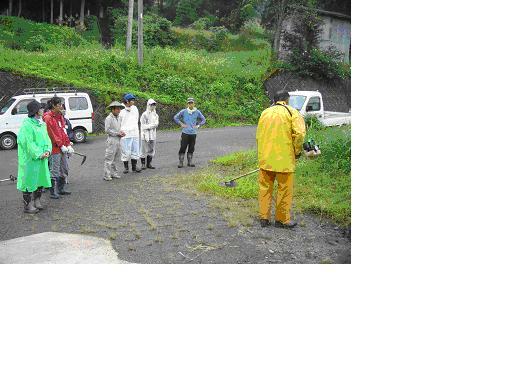 We are looking for and welcome volunteers who are willing to revitalize Iketani with the villagers again this year. 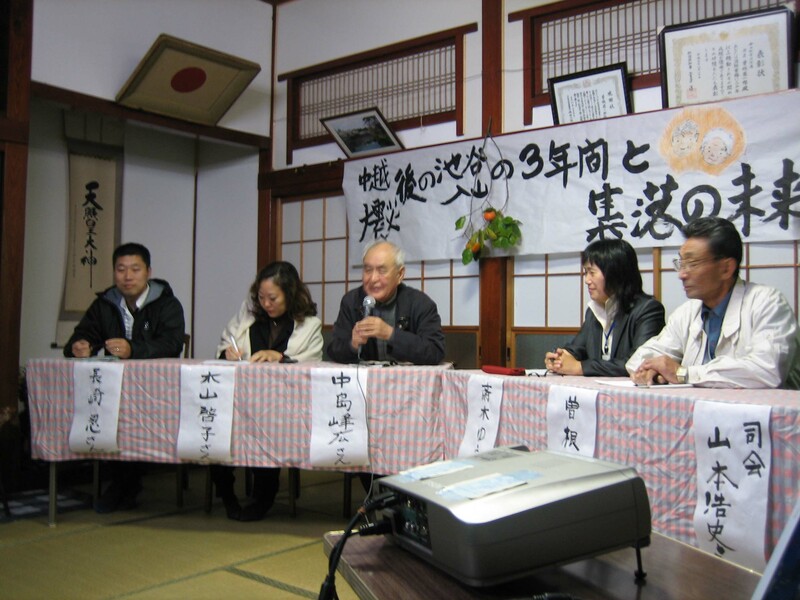 On March 6th and 7th, JEN held an Iktani General Assembly Meeting, during which the locals and volunteers discussed Iketani’s future. In addition to the villagers and the members of the Tokamachi Regional Development Planning Committee, volunteers and personnel from affiliated organizations participated, making it a great success. 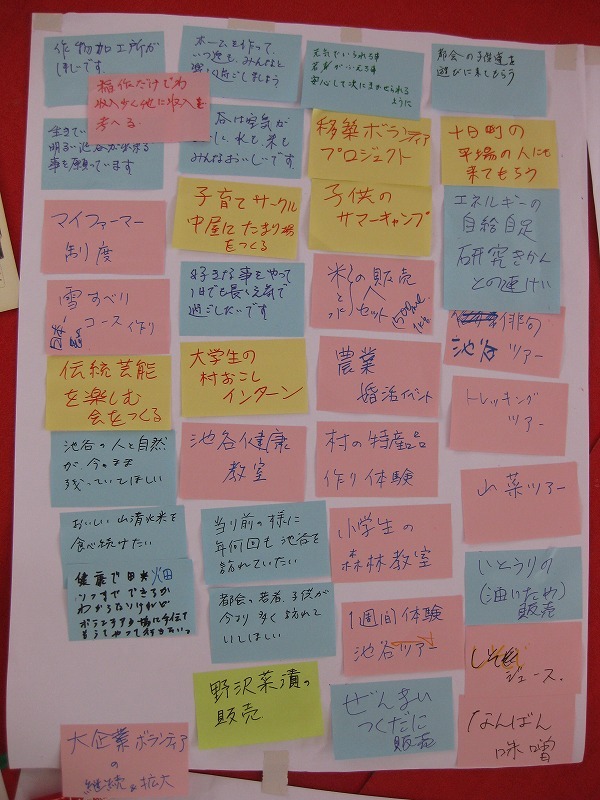 On the first day, participants were divided into groups of five or six people, and after having reviewed what had been going on in Iketani since the Chuetsu Earthquake, each group discussed what they wanted for Iketani’s future. 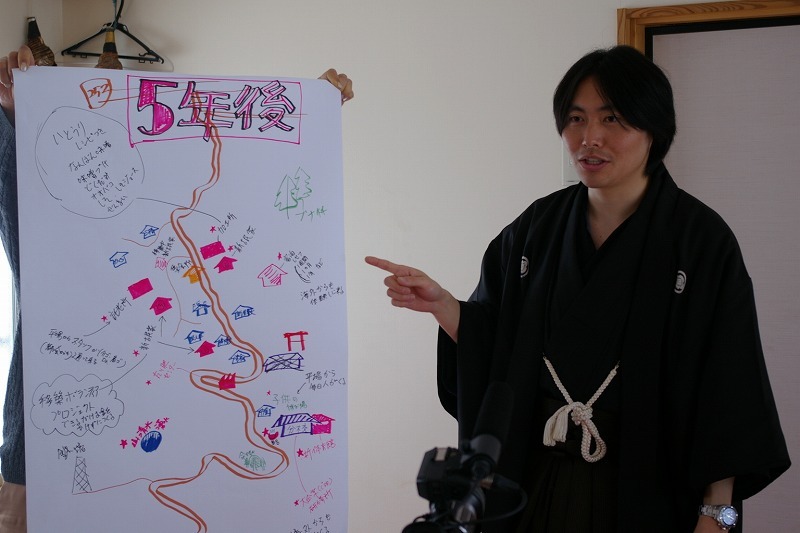 On the second day, they created a map of Iketani in five years using illustrations and characters based on the outcomes of the first day’s session. As we carried out the meeting to incorporate many different opinions, we were able to share our perception of the village’s future,. At the end of the meeting, when each participant shared their final thoughts, one villager confessed that he was not so sure if he would make it in five years as his conditions had gotten worse. The meeting came to a close as we continued thinking about our task as villagers and volunteers coming from outside the Iketani village. Now may be the crucial time for Iketani’s revitalization. The Third Session of Snow Busters Is Over!! This year’s final session of Snow Busters, which lasted from February 19th to 21st, was a huge success. Sixteen people (eight female and eight male participants) participated as volunteers in this end-of-the-year session. Although there were many first-timers and participants who came by themselves, everyone bonded immediately. Not only did they participate in the volunteer activities, but they also voluntarily prepared meals and cleaned afterward. The next morning, participants sat at a presentation of the village revitalization project and were trained in safety and know-how’s of snow shoveling by Mr. Hiroshi Yamamoto, the chief representative of the Tokamachi Regional Development Planning Committee. Later, they shoveled snow off the roof and around the entrance of the Iketani branch school. After that, we trekked to a snow-covered mountain in Iriyama, the neighboring village of Iketani. 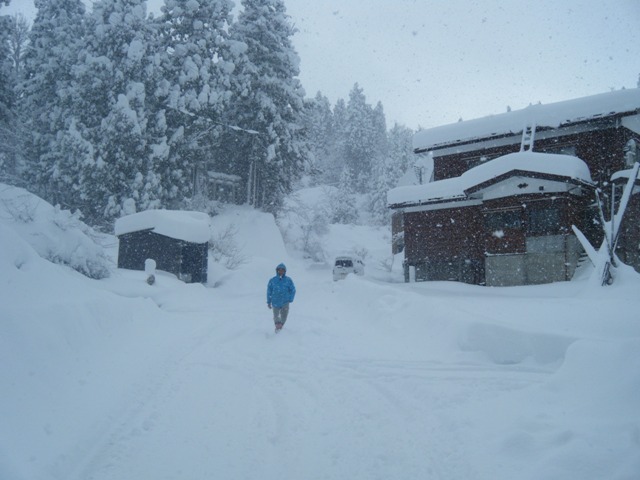 Volunteers carried heavy luggage and walked through the snowy streets to have lunch at a lodge in Iriyama. Those who were in charge of preparing lunch refrained from trekking and cooked curry and rice. 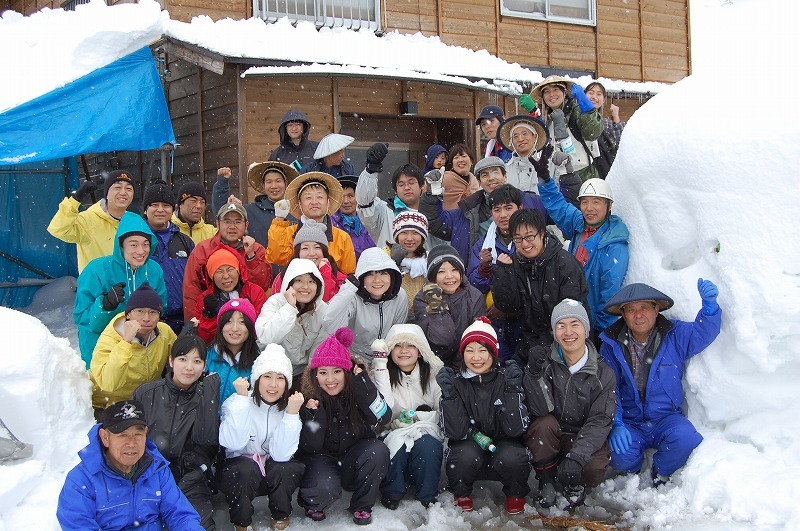 In Iriyama, adult participants had a lot of fun, having snowball fights and sledding, in addition to shoveling snow. It is curious that snow and nature take us back to childhood. At night was the party where we exchanged ideas with the villagers, which has always been the tradition. The participants had a wonderful time with the villagers and felt inclined to come back to the village. 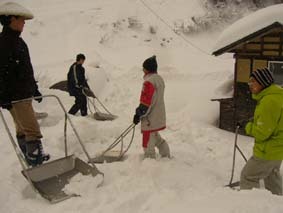 On the last day, the volunteers dedicated themselves to cleaning the snow around the branch school and the villagers’ houses. Being the true snow busters, they operated the “snow dump” with such ease! Their vehemence was unprecedented. 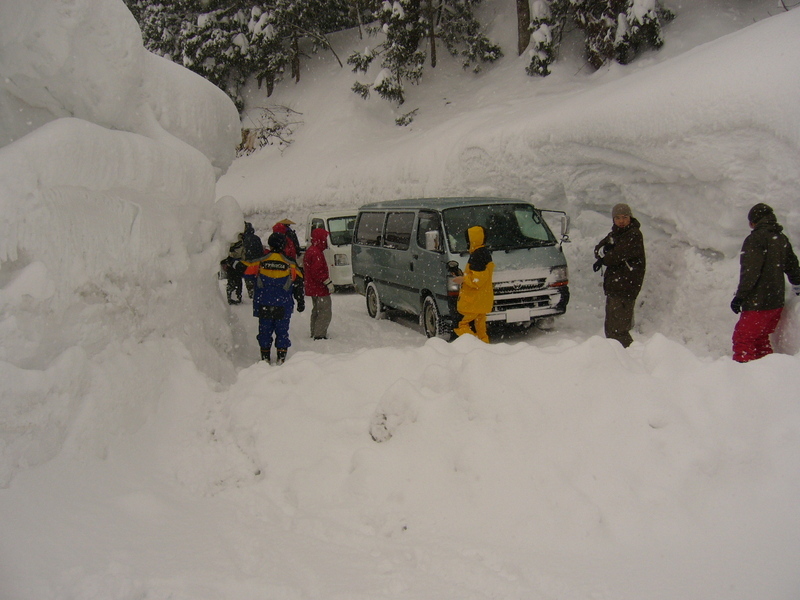 After the 2010 Snow Busters, we are certain that many experiences and encounters made in Iketani will serve as an inspiration to the participants. JEN looks forward to seeing you at Snow Busters 2011! 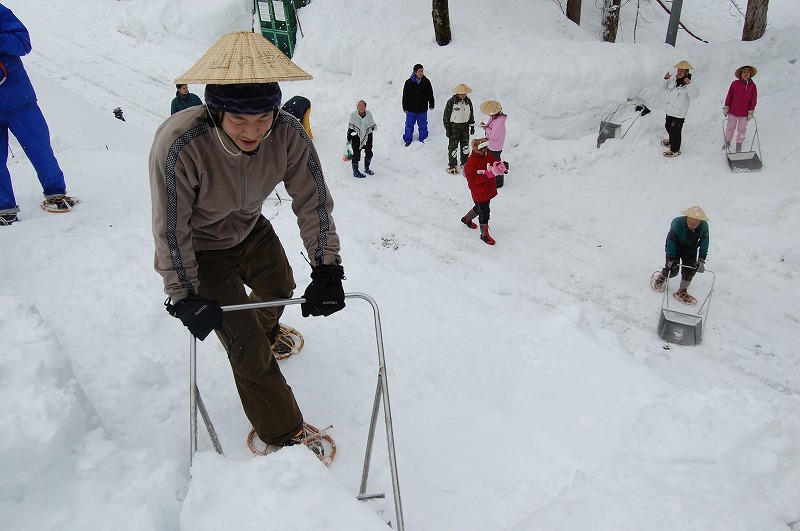 The 2010 Snow Shoveling Dojo, co-hosted by Chuetsu Disaster Prevention Frontier and JEN, was a great success! This year, Niigata had the heaviest snowfall in more than twenty years. A female college participant claims that she experienced a narrow escape from death when arriving at Iketani. 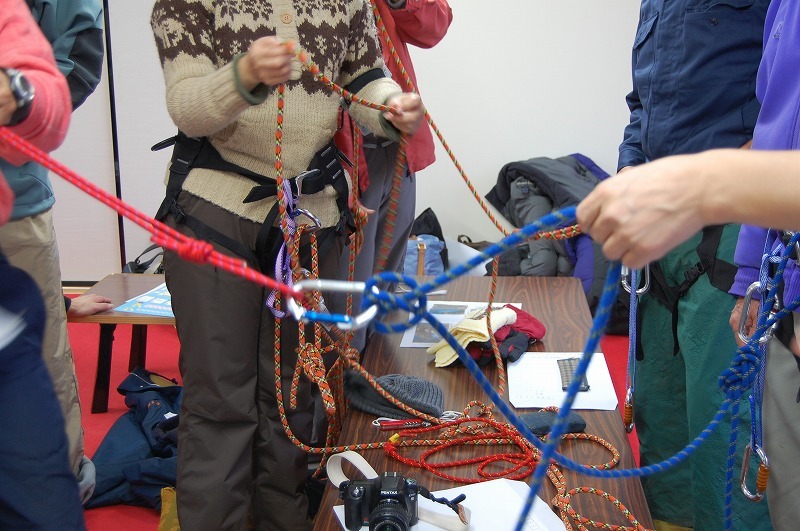 Participants were divided into beginner and intermediate levels, and learned complicated skills such as knotting ropes. Later, they set up a banner that read “Snow Shoveling Dojo” and shoveled large amount of snow around the Iketani meeting center. In addition to working at a farm in summer, I will be joining the Snow Busters this weekend, too, since I really enjoy supporting the villagers. On February 28th, that person in the Tokamachi Regional Development Planning Committee is coming to Niigata City! JEN held the first session of Snow Busters from January 22nd to 24th in three meters of snow. It was a “Super” Snow Busters since we had a diverse group of participants – from nine to sixty one year olds, and from beginners to experienced participants. In total, twelve people (ten male and two female participants) took part in the session. They sat in a one-hour lecture that taught basic knowledge and techniques of snow shoveling, and were trained in security measures. 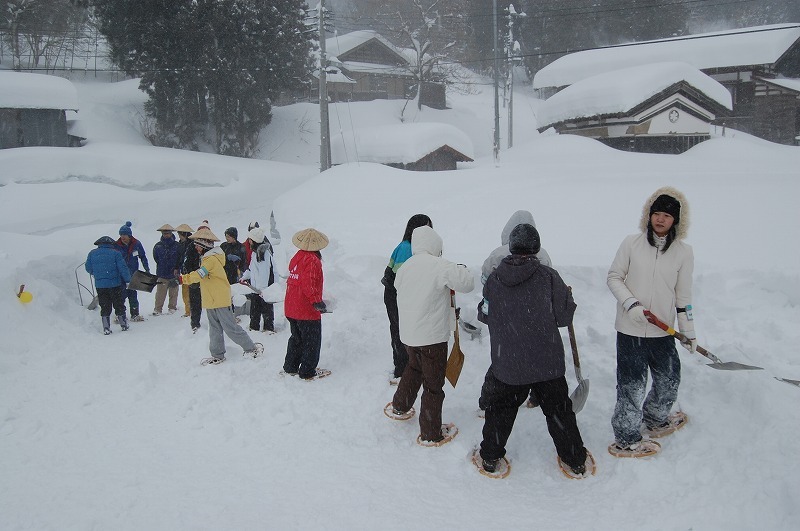 After that, they tried snow shoveling wearing unfamiliar shoes called kanjiki*. 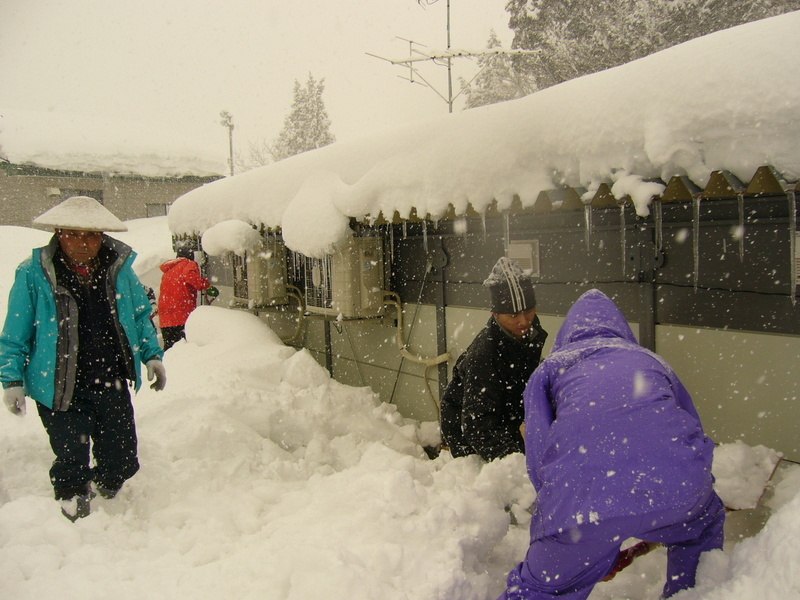 Participants utilized snow dumps**, invented through much research done by the Tokamachi locals, shoveled snow off the roofs, and moved the snow to the sides. Their harmonious teamwork was amazing! At night, they had a party with the villagers. Singing songs with dance and clap, enjoying the sound of conch, guitar, and drum, it was like a “small concert,” and everyone was enchanted by the atmosphere. 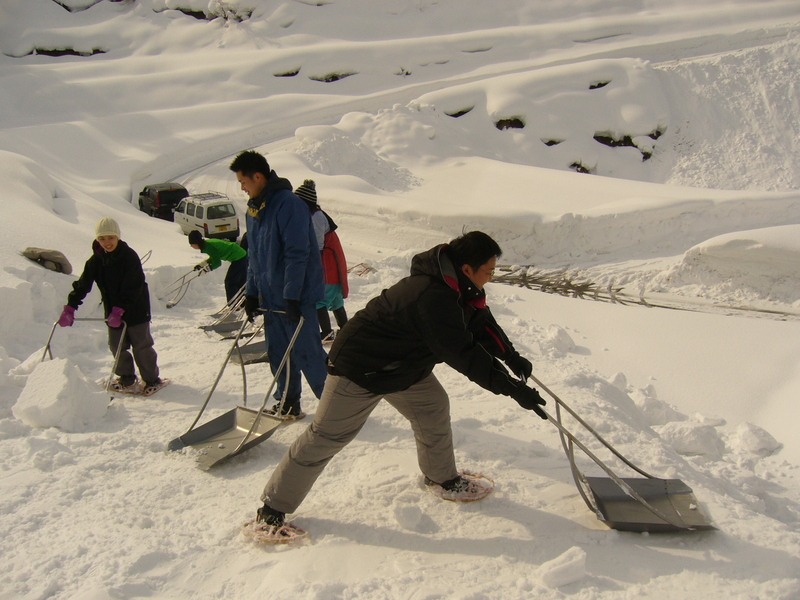 Participants expressed their desires to improve their snow shoveling techniques in order to shovel even more and assist the villagers. 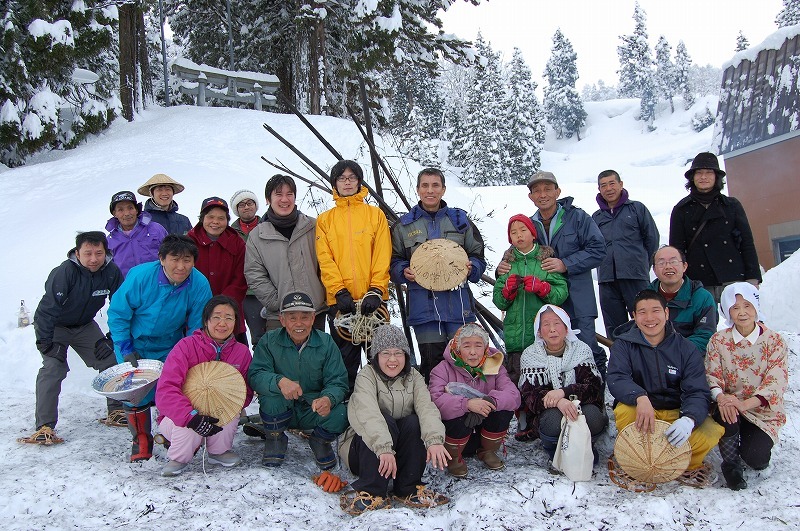 Snow shoveling is indispensable to the lives of these Iketani villagers, although they are aging year by year. JEN is will continue to put effort into hosting Snow Busters and fostering the strength of Iketani. Happy New Year! In Niigata, it’s been snowing since the end of last year, and we had about two meters of snow in Iketani. 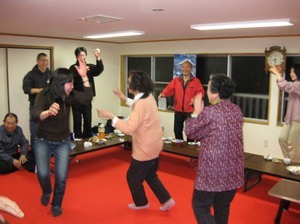 On January 10th, JEN had a New Year’s party, calling it “The Gathering on the New Year’s Day in Iketani” with villagers and volunteers. 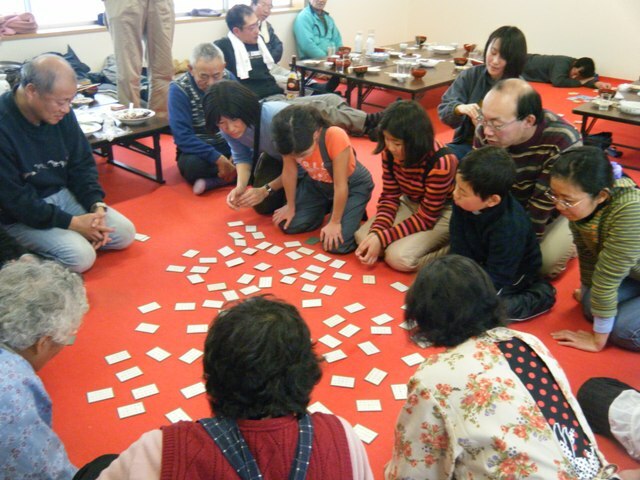 We spent a typical New Year’s Day pounding rice cakes, shoveling snow, and playing Japan’s traditional cards known as “karuta” and Hyakunin-Isshu. Also, before and after the party, volunteers helped local people remove the snow (or shovel snow off the roofs). This time, three groups accompanying children took part, and the children enjoyed making snowmen and snow huts alongside their parents while adults were pounding rice cakes and shoveling snow. It was such a great atmosphere. Furthermore, a volunteer gave a “yoga” lesson, which wasn’t part of the original plan, and the elderly women in the village were very pleased to feel refreshed. Living in Iketani, we feel that the rich natural environment and the gathering of the old and the young generate a lot of new things. Perhaps it is through these things that “richness” is created in this place. JEN will do its best again this year aiming to inherit the village onto the next generation and create a community where the elderly feel secure. JEN hopes for your continued support this year. An earth-walker, Mr. Nakatani planted trees in “The Forest of Life” in the past, but growing trees was difficult because of poor water-drainage. The members of the Tokamachi Development Committee prepared for this time, reflecting on the previous event. Before planting seedlings, Mr. Nakatani carefully explained what the participants are about to do, and the locals’ wisdom and cooperation made the process a pleasing one for the participants. JEN will continue to plant seedlings with care, imagining that in 30 years time, the trees will grow tall and large, as well as the future of Iketani, and us. Lastly, all the practices of the tour were over by taking a commemorative photo of the participants and all the locals of Iketani. “Thank you, I will be back” “Thank you, please come back” exchanging words each other. he Village Revitalization Volunteering, Supplemental Episode? 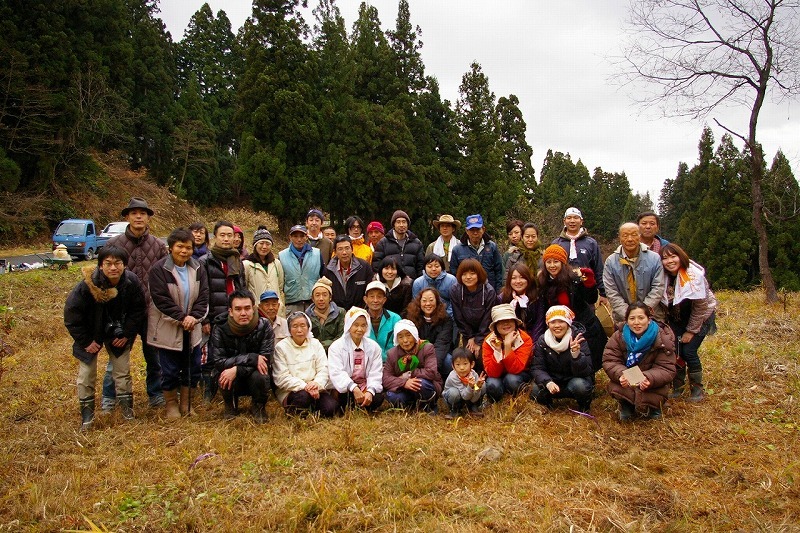 On December 5th Saturday and 6th Sunday, 18 people visited Iketani to participate in the EARTH TRIP vol.1, “The Earth Walk in Iketani, Niigata & Tree Planting Tour”, organized and held by TOKYO SOURCE. On the first day of the tour, an earth-walker(＊), Koichi Nakatani and JEN secretary general, Keiko Kiyama had a casual talk over Iketani, called “The Earth Talk from Iketani” at Nakaya, a renovated old house. The encounter of Nakatani and Kiyama goes back to 2006. After the talk, JEN had an exchange with the locals. Welcoming a cook from the neighboring village, Matsunoyama, participants enjoyed traditional food and sake of Echigo (the old name for Niigata Prefecture) and had a heartwarming time with the villagers. JEN will introduce the details of the festival of tree-planting in the next news report. 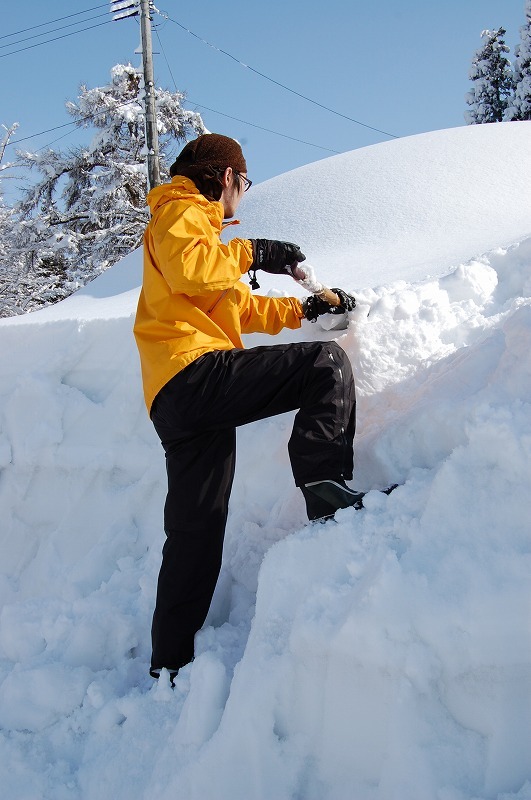 Village Development in Niigata: Volunteers Needed for Snow Busters!! It has been four years since the earthquake hit the village. 4 families out of 6 families in the Iketani village are elderly people, and therefore the village faces the threat of depopulation. 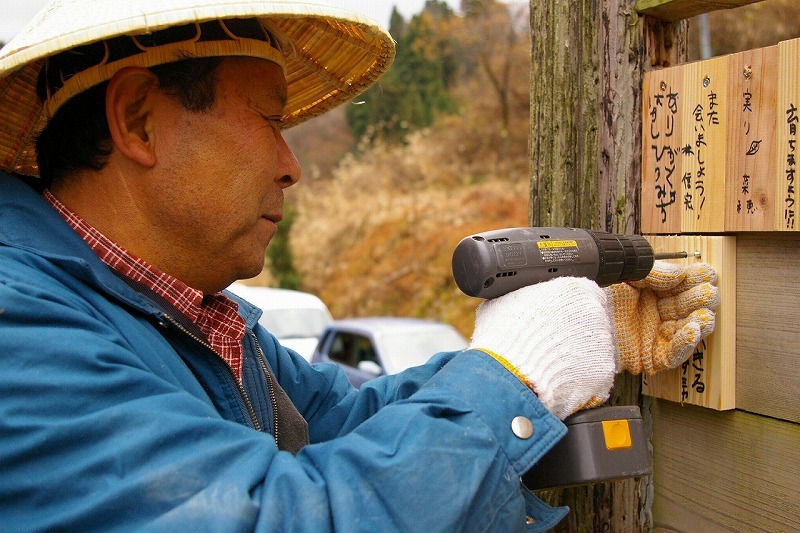 Despite this, the elderly are engaging in village revitalization efforts with huge energy. Since 2005, JEN has aided the busy farming season and recruited volunteers to assist towards their recovery. During the winter season, we are seeking volunteers to visit the area and help clear the snow. We need your support! There will be three sessions for Snow Busters. ¨ The activities may vary with the changes in the weather and other conditions. ¨ Please bear the cost of the transportation on your own. ＊ Please inform us if you need to borrow long boots. 1. Download the application from here JEN website, and send the filled form to us via FAX or by mail or through an e-mail info@jen-npo.org. ＊ If you are travelling by car, please park in the parking area of the West or East exit and meet us at the Hokuhoku Line’s gate. ＊ This project is cooperated with Tokamachi-shi regional development executive committee. 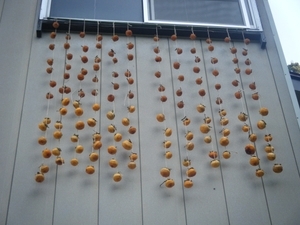 On November 7th, a festival, called the harvest festival, was held in Iketani, and approximately 70 people participated. This festival is to celebrate the annual local harvest. 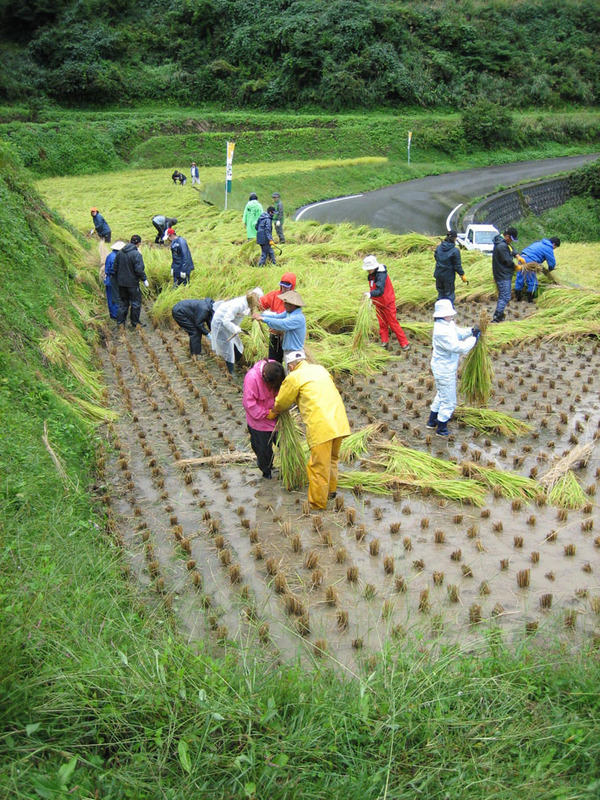 Started in 2005, the year after the Chuetsu Earthquake, people commemorate the harvest of rice from September to October. 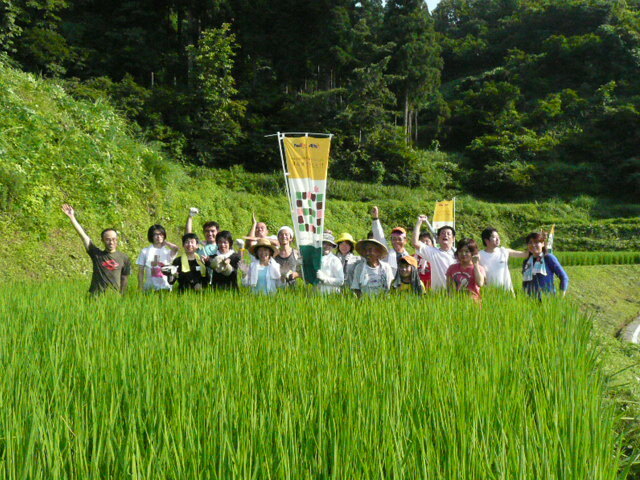 Before the earthquake, people from big cities seldom visited Iketani, so at that time only the local farmers held this celebration, called nojin (farmers) festival or Iro party meaning the celebration of rewarding people for their dedication and services, after harvesting rice. 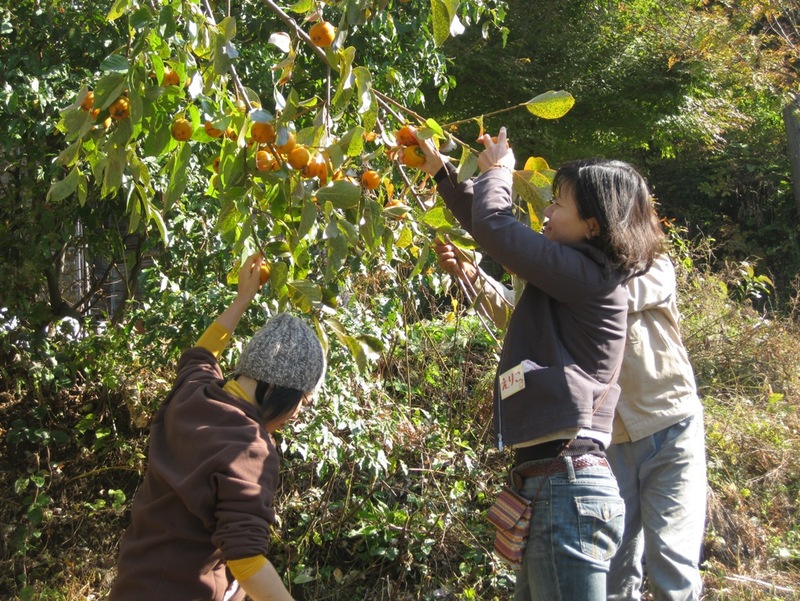 As usual, we celebrated this year’s harvest with food raised with nature’s blessings in Iketani, and this was literally “a festival to celebrate harvest.” JEN volunteers cooked carp that were caught in a local pond and gathered persimmons. 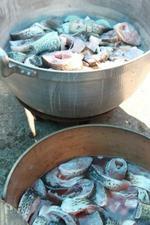 Cooking raw carp was my first time, since I grew up in the urban area. What I tasted through this festival was not just fresh meals but meals with new experiences! I have visited the Iketani Branch School, in Tokamachi City, Niigata Prefecture, since July, 2005. 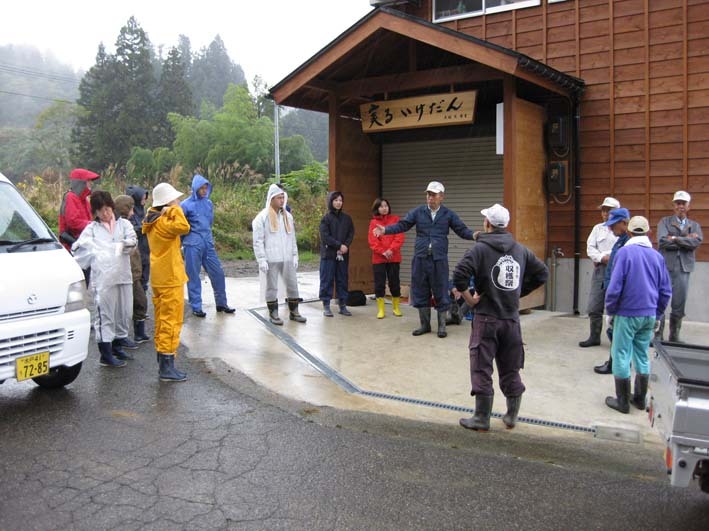 Since the Chuetsu Earthquake in 2004, JEN has walked together with Tokamachi City, Niigata Prefecture in order to revitalize Tokamachi, by taking measures for depopulation, and sustaining the village. From right after the earthquake to three months later, I was in charge of Niigata, and this visit was the first time in four and a half years. The Iketani Branch School has greatly changed. As the fact that Iketani has been welcoming volunteers for five, there are more dishes, slippers, food, stationeries, and sleeping bags, along with many other things, to accommodate for more people. For volunteers coming in winter, there are also many electric blankets. There are many volunteers participating, and most of them arranged their schedules to visit Iketani not via JEN but directly with the Tokamachi Regional Development Planning Committee. I visited several project sites of JEN in places like Afghanistan and Sudan from 2005 to 2009, but never once did I feel that project site of JEN　is as self-sustainable as Iketani, Niigata. The entire five years have passed since the Chuetsu Earthquake, and the projects in Niigata will continue to change. 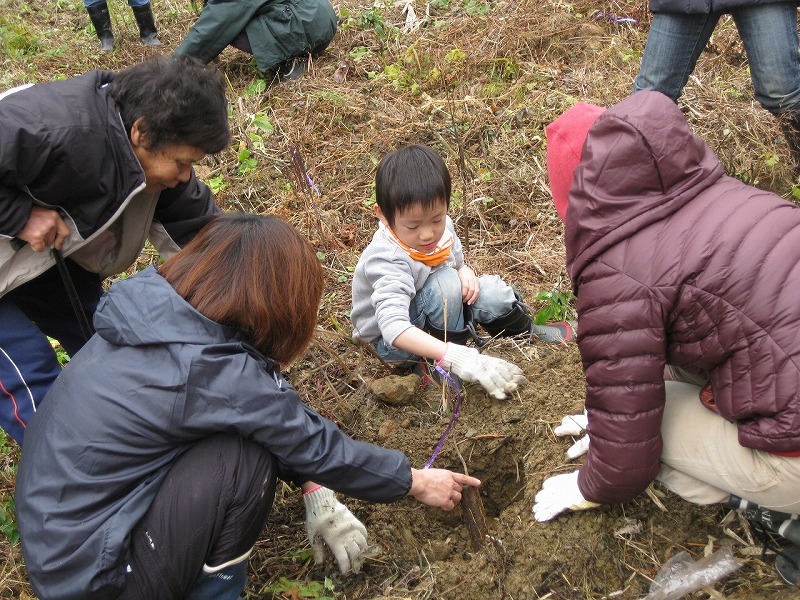 The continuous improvement in the project in Iketani is due to volunteers and advocates for Tokamachi Regional Development Planning Committee. Then, what supports such people? I really would like to find an answer during working as an officer in Niigata. We are organizing “Snowbusters” this winter again! Winter is around the corner in the Iketani Village at this time of year, and the locals start reaping buckwheat and making dried persimmons. 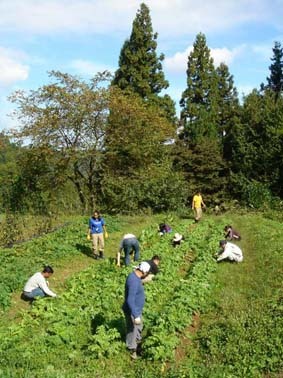 Volunteers stay in Iketani for approximately three days, but this short stay in fact encourages the villagers to do agricultural tasks. Generally, first snow of the year is in the middle of November. They are gradually preparing for the long coming winter. 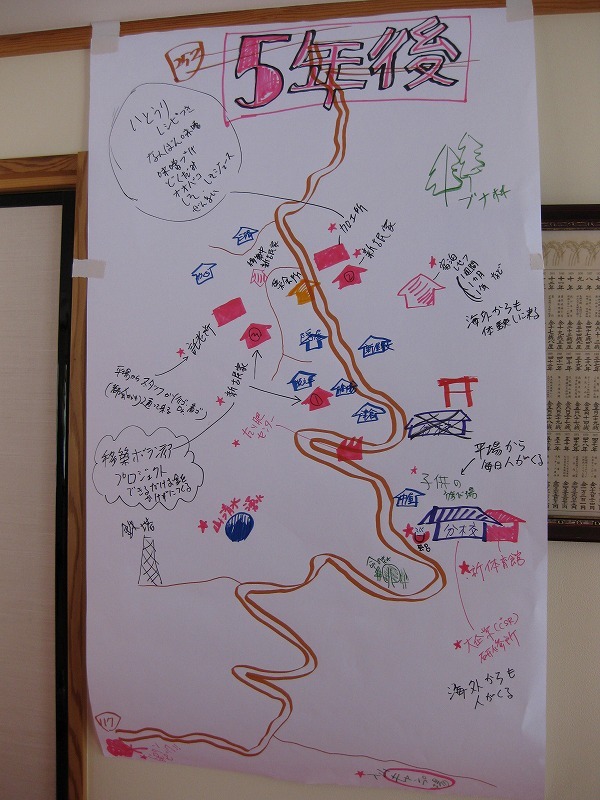 From October 9th to 12th, the fourth session of the Village Revitalization Volunteering was held. This was our first time to hold a volunteering session without a JEN coordinator, but even so, things went very well thanks to the experienced members of the Tokamachi Regional Development Planning Committee. The participants of this session were very few, in fact only two, but this was their fourth visit to Iketani. They fully took advantage their past experiences. First, they helped villagers “rub rice in the husk.” This means peeling of husk of rice, which is then dried using a dryer,. The dried rice is then packed 30kg each. Following the local fathers’ and mothers’ instructions, both of them worked quickly and efficiently. Even though farmers in Iketani are professional rice growers, carrying 30kg-rice is hard for the elderly. the two participants were great helping hands Feeling the weight of rice, they seemed to realize that their assistance was vital to rice growing. Villagers were very happy; “the participants helped us a lot,” and on the other hand the two supporters were also pleased to hear that “we could support the locals.” JEN thinks that this volunteering session was another great success. This is the final episode of the story of Akita Momiyama, (Mo) which started at the beginning of the month. You have enjoyed you time at Iketani so much that you extended your training period. Could you tell us how you feel about Iketani? Mo: I respect the way farm families as well as other rural people work hard. Still, it is difficult for them to sustain their lives, or do they have successors. I consider the current condition of agriculture an important social issue which needs tackling especially in light of the importance of agriculture to society. If our dedication to reforming Iketani is successful, it would bode well for the prospects of other project villages in the future. Social change, deteriorated agricultural management, the spread of agricultural machines, and other factors have caused people to leave farming villages as their labor has become obsolete. 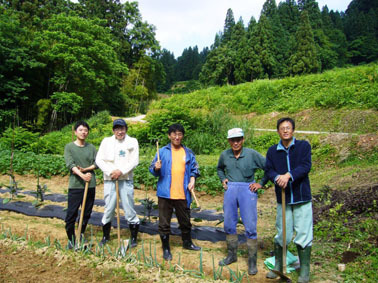 JEN’s volunteer and agricultural programs in Iketani are full of potential, and many people have participated in them every weekend. Thank you so much! JEN hopes that we will keep a good relationship between us. From the last September 25th to 28th, JEN implemented the last session of “LET’S GO TO TAMBO! !” which was to harvest rice. All 17 participants harvested rice and dried rice ear on the tree out in the sun, in the half-acre paddy field .. it's called "Hazakake" process . The age range of the supporters varied from a 4-year-old child to a forty-something jet setters. As Iketani has a relatively small elderly population （only 6 old-aged households） it is now not unusual to see elementary students and/or babies in the community. As usual, each child assisted in harvesting rice as much as they could. Additionally, JEN appointed one of the management volunteers a “person in charge of children” in order for their parents to concentrate on activities. Children occupied themselves by running around in paddy fields and collecting insects from the mountainside. The job of the volunteer is a busy and stressful one, as he or she always attends on children, and all their problems! Upon arrival, the children seemed a little uneasy in the unfamiliar environment, with its rural scenery, insects and country life. However, easing their anxiety is one of the most important roles for the minder. Two families took part in this session of “LET’S GO TO TAMBO! !”for their second year running. We will continue introducing Mr. Akita Momiyama (hereafter called ‘Mo’)! JEN: Could you explain how and why you ended up training in Iketani? Mo: Agriculture can be interpreted in more than one way. I was originally interested in “rice terrace” and “hilly and mountainous areas.” Therefore, I consulted an NPO, Tanada Network, and they introduced the Iketani Village to me. JEN: I heard that your training term in Iketani is two and a half years. It sounds like a long time. Mo: At first, I was planning to come here last October and stay to get training until this November. However, I decided to extend my training term since I really believe in Iketani’s activities and its stance. I am now planning to stay until March 2011. JEN: What are your objectives of the training? 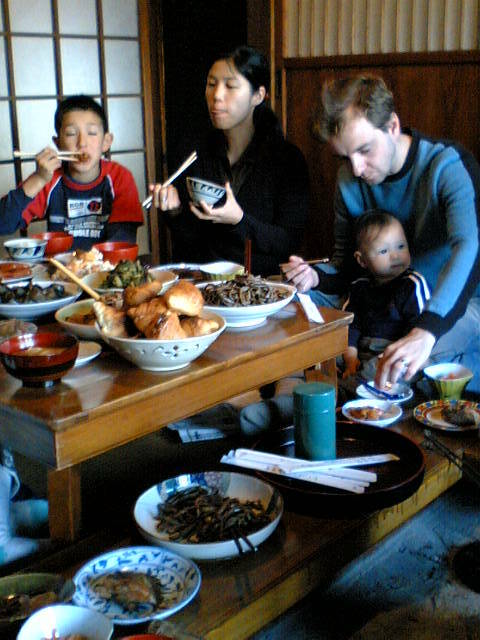 Mo: Farm families are called “hyakusho,” meaning various (a hundred) people with their own different names. Indeed, I feel that their lives cannot be successful unless you do everything you can to help. Raising crops is not enough. 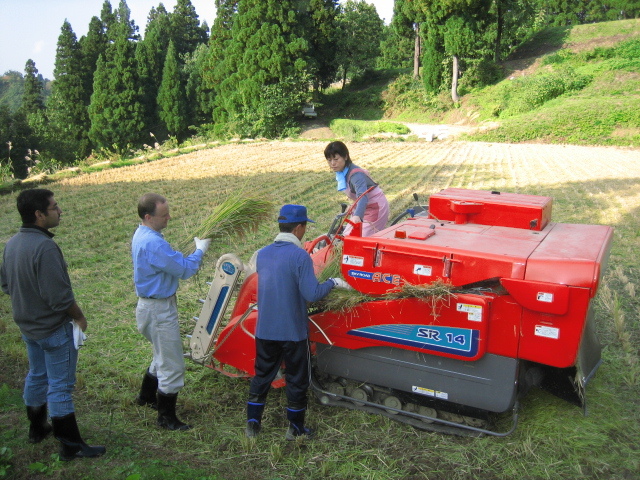 As hyakusho, my tasks widely cover sales, accounting, machine reparation, agricultural road paving, and interpersonal relation-building. I also feel that we should appreciate the blessing of nature as much as possible by not wasting these home-grown vegetables. I would like to experience all that’s necessary to earn an agricultural living and learn farm families’ mindset. JEN: I see. After listening to your explanation, it seems agriculture is very different to the stereotype that many people have, ’agriculture = raising crops’ in mind. Please give me your typical daily schedule. Mo: Villagers’ schedule is pretty regularized. After this, I participate in the Village Revitalization activities and meetings. 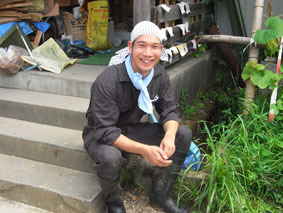 My daily tasks are agricultural work, sales of rice, and preparations for events. That’s all for today so we will deliver the final report about him next time! This time, let us introduce Mr. Akita Momiyama! Those of you who participated in Niigata Volunteering should be familiar with him already, but even if you have not visited Iketani, make sure you read this entry about Mr. Momiyama, as he is somebody who has worked extensively with JEN. As an agricultural trainee, Mr. Momiyama is staying in Iketani since October 2008 until March 2011. What drew Mr. Momiyama, (born and raised in Shonan) to agriculture? Momiyama: I was born and raised in a big city, so I have always been interested in nature and farming-centered lifestyle. Traveling and mountain climbing and reading essays of Michio Hoshino, an animal photographer, and books by Tsuneichi Miyamoto, a folklore scholar, had eventually led me to ‘agriculture’. JEN: I see… So did you choose to study agriculture at university too? 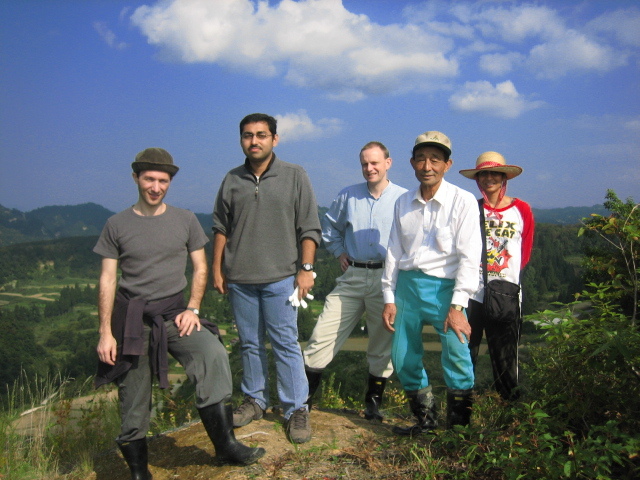 Momiyama: I was passionate about agriculture, and certainly intended to study it extensively. However, I ended up devoting 4 years to a school festival committee. JEN: You must have made unforgettable memories. What did you do after graduation? 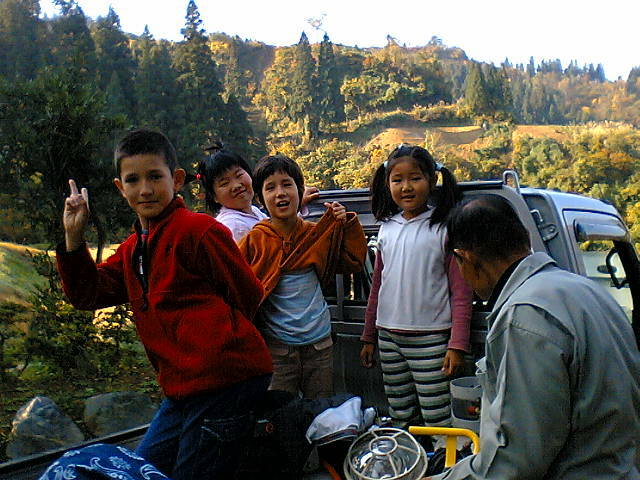 Momiyama: After graduation, I spent on year focusing on farming and studying at Nippon Nogyo Jissen Gakuen, http://www.nnjg04.com/ in Ibaraki Prefecture for a year and worked as an assistant and officer in this farm. After experiencing what it is like to study agriculture, I came to feel the necessity of practical experience and background in an agricultural field and decided to go on training. JEN: Let’s call it a day. Next time, we will offer an article about how Mr. Momiyama got to Iketani and what he wants to learn from the training. Do not miss the next entry! All walls have been plastered, and varnish put on the pillars dried and turned to good colour. The floor is shining as it has been waxed. New straw-mats (tatami) have arrived, and all we have to do for people to stay is to install electricity. Volunteers were installing tanks for irrigation and storage of natural water from the mountains. Also they were putting bricks on the flower beds. A name of this house is now being considered by Tokamachi Regional Development Planning Committee. Please let Tokamachi Regional Development Planning Committee （chiikiokoshi@gmail.com）know if you have a name which you think “This is it!”. We look forward to an adorable and wonderful name. We have one more topic this time. On July 26th Echigo-Tsumari Triennale (Daichi-no Geijutu-sai) started. There are full of installation art works, which are too unconventional to understand, from all over the world. This is 4th session of this festival this year and a work has shown up at Iketani! It is “Mori-no-Hitokakera (A Piece of the Forest )” created by an artist / architect; Ms Shoko Fukuya. Many swings are placed at grove of beech trees. We can actually ride on these swings, and the swings look like “Heidi’s swing” as those are hanged by long wires from high place of the trees. Adults even enjoyed that as if they were children. Get together at the Iketani Blanch School at August 15th night! Please join us! Village revitalization volunteers are wanted. In Iketani, people in the village are now in the middle of preparation for Bon Dance festival after 30 years . Thanks to the village revitalization program which started when the village was restored from Niigata Chuetsu-Oki Earthquake in 2004, many people are starting to visit this depopulated village. The villagers started challenging depopulation now. It has been 5 years since the earthquake occurred, this year, people who used to live in Iketani will visit there again and sing and contest a traditional, regional song with the current villagers. The villagers, the volunteers and visitors at the Bon Dance festival will dance together with the singing voices and Japanese Drums. These drums were protected by grove of the village shrine and survived the earth quake. During the festival, local cuisine cooked by women in the village will be served as well. Please support “The next challenge of Iketani and Iriyama” with your power. We look forward to seeing you at Iketani! As reported before, there is an old abandoned house located just below the Iketani Branch School where the volunteers stay when the activity is held. 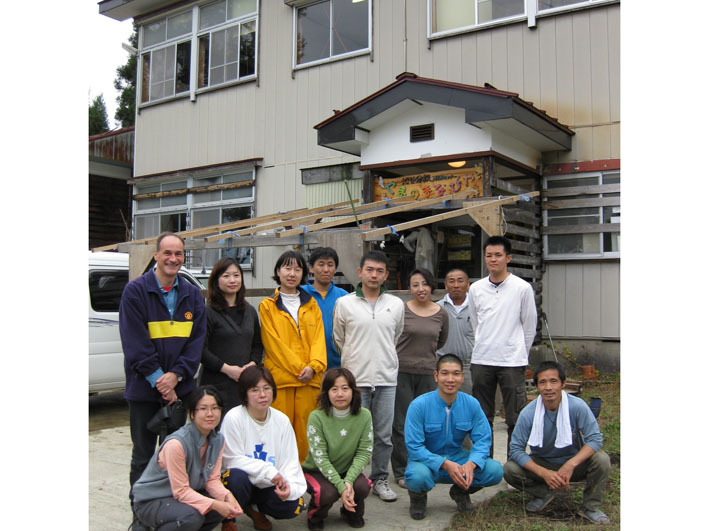 After the earth quake in 2004, nobody had used this house, however, renovation by volunteers officially started this year. The volunteers completed the rebuilding of the house, repairing, renewing the exterior wall and coating it with an antiseptic material. 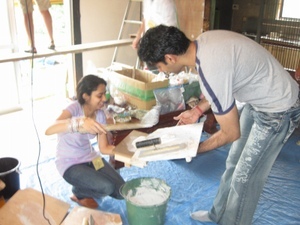 The photo shows a scene of coating of plaster for the wall by volunteers from Morgan Stanley. The plaster is very sticky and it was difficult to coat skillfully. JEN appreciates your contribution. We really look forward to seeing the completed renovation and the house will be a wonderful facility which is useable for many people who visit Iketani. 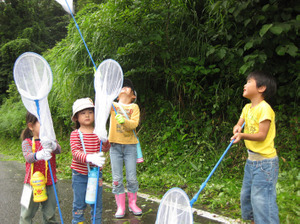 On July 4th, A“Treasure Hunt in Iketani” was carried out as one of the village revitalization projects. There were 19 participants this time and they mainly came from FedEx. NPO Community of School (Machizukuri-Gakko) kindly contributed to facilitate this event. 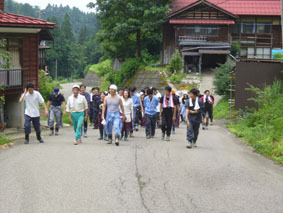 The purpose of the treasure hunt was to discover the attractive part of Iketani by the participants from outside of the village. The villagers excited to share and discover the hidden secrets of Iketani with outside visitors that encourage all of you them to revitalize the v illage. There were many wonderful surprises newly discovered in Iketani and Iriyama and they were there for adults , children foreigners(!) and the villagers to discover. During the hectic volunteer activity, they discovered many things, too. For example, they were taught traditional recreations, such as bamboo-leaf-boats, water guns, catching beetles and fireflies. It was a great experience for the children. In addition, they experienced the culture of the village and the greatness of tradition by a culinary class took place as a part of the activity, which was taught by the village women. In Iketani, the villagers are planning a Bon-Dance festival first time after 30years of absence. More information will follow. Please look forward to it! Village revitalization Volunteers are wanted too! Volunteers for restoration project of the old abondoned house, Urgently Wanted !! 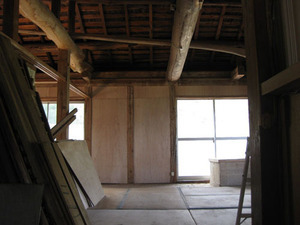 An old house in Iketani will be soon revived! 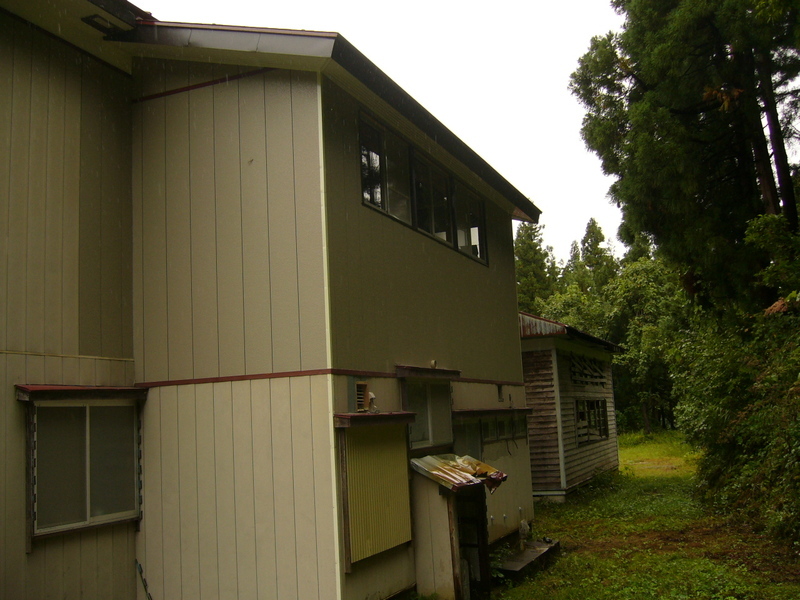 Tokamachi Regional Development Planning Committee is currently renovating an abandoned house located just below of the Iketani Branch School where the Village Revitalization volunteers stay when the activity is held. In the future, the trainees for successors of the rice farmers( or specialist for Agriculture) will stay at this house. 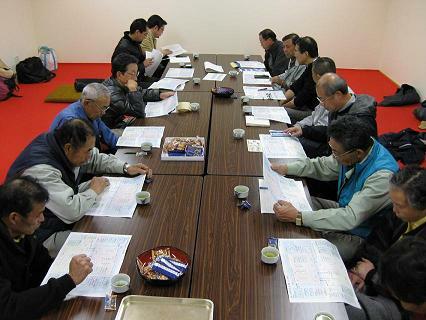 The committee is planning the usage of the house which is not only for village revitalization volunteers but also for ordinary visitors when varieties of village events are held. 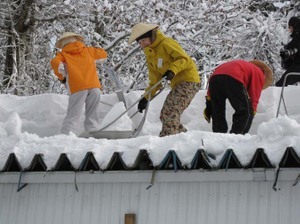 Although the house was abandoned when the earthquake occurred, they have managed to sustain the building as the villagers have continued snow-shoveling of the roof in the winter and so on. There are many beams in the house therefore it is strong. 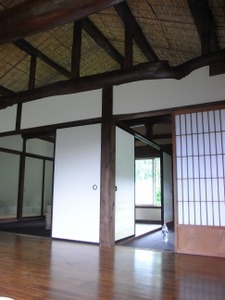 The house is made in wonderful taste like that of the Old Houses in Niigata, snowy region. The committee wishes to complete the finishing phase of the renovation, such as the rendering of clay wall, papering sliding doors (SHOJI) and coating using the efforts of volunteers. 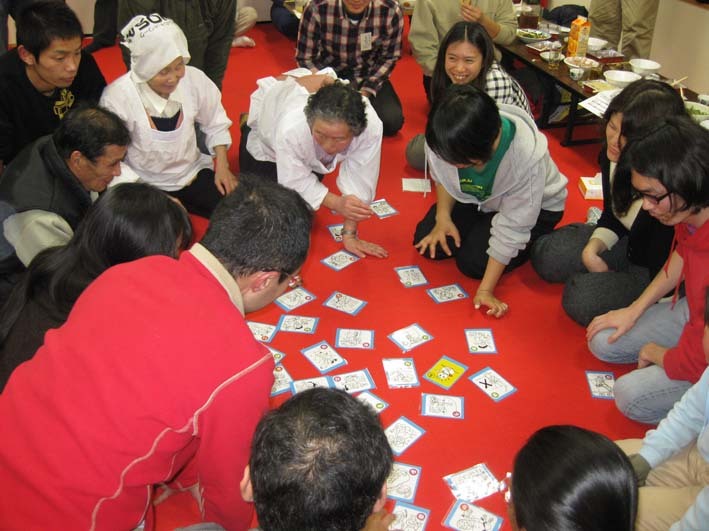 Village Development in Niigata: Volunteers Wanted!! In 2004 an earthquake of great magnitude devastated the region of Niigata. Despite this tragedy, Iketani and Iriyama of Tokamachi have stood up and faced the damage and started the reconstruction process. 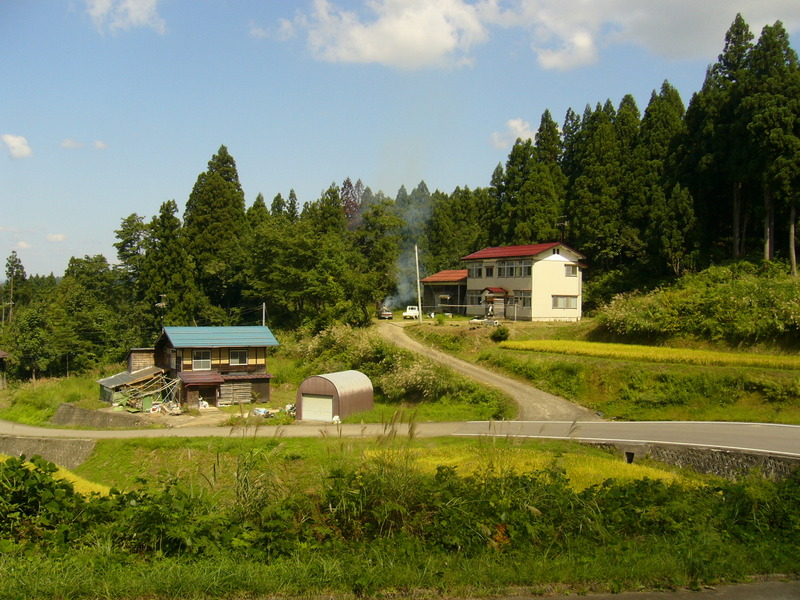 Iketani and Iriyama are small settlements consisting of a total of 6 families. Of these 6 families, 4 families consist solely of elderly people, and therefore the village faces the threat of depopulation. Despite this, the elderly are engaging in village revitalization efforts with huge energy. Since 2005, JEN (An international NGO) has aided the busy farming season and recruited volunteers to assist towards their recovery. 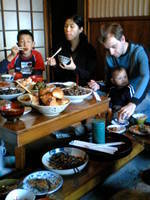 This year JEN is aiming to establish a system for the continuous return of volunteers to Niigata. Project volunteers are an essential component of the village recovery. We urge you to apply! The revival of the region affected, adjustment and relief of the villagers environment, conservation, farming with the villagers, helping with the preparation of the harvest festival, collaboration with the locals. Transportation costs are not included, therefore you must make your own way to the location. The location is accessible by car or train. The trip will stop taking volunteers when the number of participants is full for any of the trips. First download our 「application_form_for_volunteer_snow_2008.pdf」をダウンロード (in japanese) and fill in the necessary information. Please send the application form by Fax or email. If you do not have the above nor not able to read japanese, then contact us by telephone (in English) or send an email for enrolment, and then we will send you the application form by mail. Gloves( non-slip )、long boots/rubber boots、long sleeved shirt, hat, mask, rain coat etc. 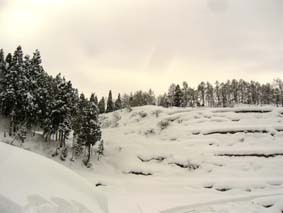 I have participated in the second session of Snow Busters 2009! This is Domestic Department’s Intern, Emika. It was my second visit to Iketani. For many years I had been living in Cairo that when I went for the first time in September, it was like an adventure more than a volunteering trip. It was my first time going into a farming site so far into the mountainside. As expected I missed the train, got lost in no-human station, and ended up being late. Despite these difficulties even reaching to Tokamachi station, my time at Iketani had been a memorable one. For the first time through JEN’s activities, I was given the opportunity to experience and face the issues of Japan. As I returned to Tokyo last year, I had been quite down realizing the disparity between the images of Japan I had when I was in Cairo and the reality. The sight of culture and tradition disappearance, the lack of Japanese identity in people shocked me. But Iketani was different. The motivation and the movement of the wide network of people along with JEN to face the issue of depopulation and rice prices at Iketani very much moved me. Iketani have awakened me and gave me the power to become more positive living in Japan. I became determined to work together with the people involving in Iketani to make my country a better place by preservation of tradition and reformation. Many of the participants at Snow busters second session were repeaters. Some were third or fourth time visitors. I feel that there is something that every participant has towards Iketani like myself. I hope through this energy of people involved in Iketani, there will be some changes and improvements made on such a precious area of Japan. 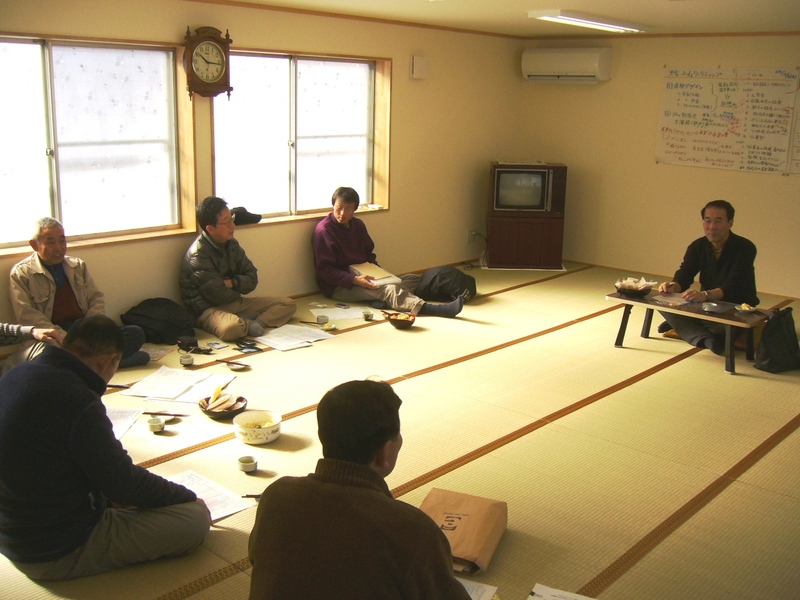 This is a report of a village revitalization meeting held in Iketani on December 5th. 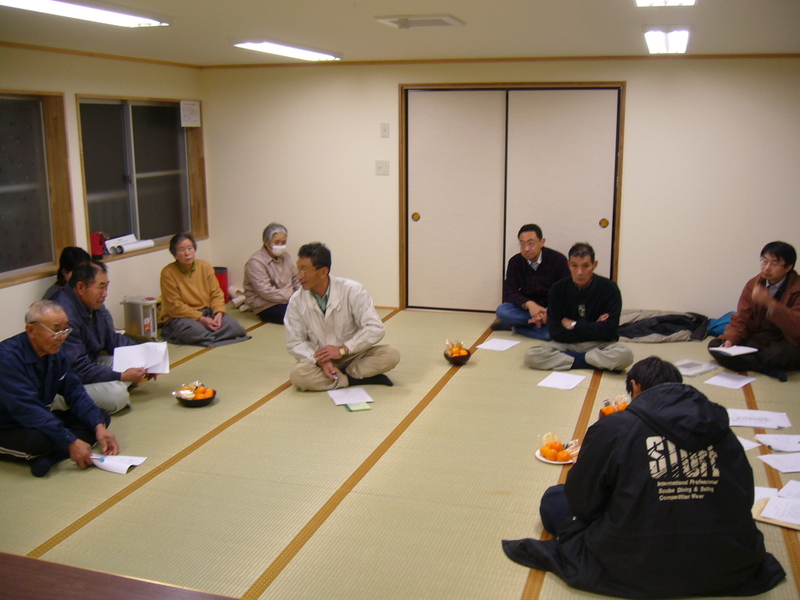 Over 20 people, including the villagers and involved parties, got together at the Iketani village Meeting House. 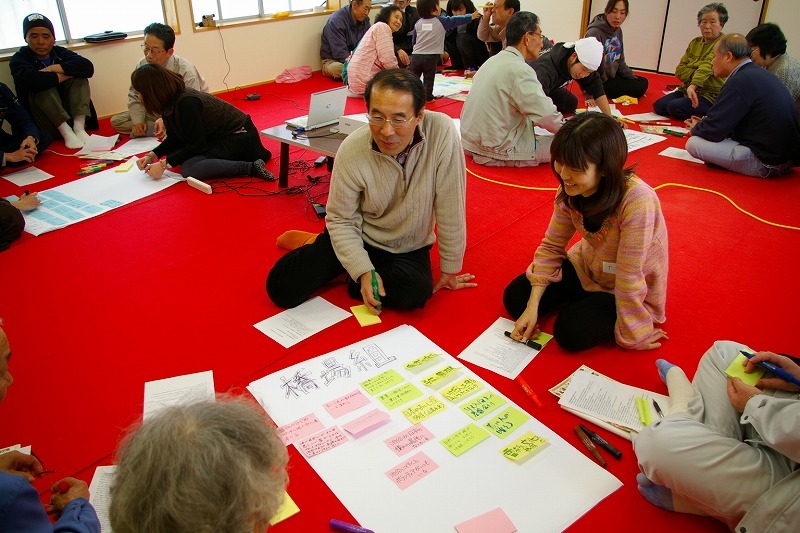 Each participant has a different stance on the issues; however, they all share a common ambition for “Village revitalization in Iketani”. Although the meeting was scheduled for 3 hours, the meeting went on for 4 hours due to the heated debate. Winters in Iketani are extremely cold, and the day of the village rivitalization meeting was a cold, snowy day. Once there is ample snow on the ground, the Snow Busters program will be held as part of the Village Revitalization Volunteers program. Since the snow removal is physically tough work, the work of the volunteers will be of great help to many elderly people in this village. Both the villagers and JEN are looking forward to your participation. 1. Download an 「application_form_2007_emily_edition.pdf」をダウンロード from here JEN website, and send the filled form to us via FAX or by mail or through an e-mail info@jen-npo.org. This is a summarized report of the Village Revitalization Volunteering that was held for 3 days and 2 nights from the end of October to the beginning of November. There were nine participants this time. 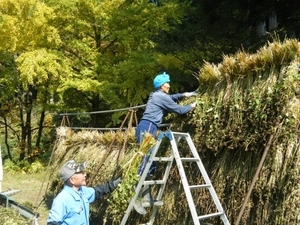 The volunteers prepared for village's “The Harvesting Festival”, which is the biggest event in the village of the year. They were under the instruction of the villagers, such as cleaning the site and cooking and making the signboards. In preparation for the festival, the volunteers had many opportunities to talk with the female villagers, especially more so than the usual Village Revitalization Volunteering sessions. The volunteers enjoyed working with the villagers. At the festival, there were some programmes such as a presentation by the volunteers about the “Charm of Iketani ”. It was prepared by the volunteers themselves, and it is a play by a local theatre company and it is a talk-relay by concerned parties. Everyone involved in Iketani in a variety of ways discussed issues seriously and enjoyably, and shared a wonderful time together. The big banquet, which was attended by over 50 people in total, and it became memorable event for both the volunteers and the villagers. This year JEN will organize “SNOW BUSTERS” again, Click here to apply. This is a report of the Village Revitalization Volunteering 3-da y and 2-night session that took place from October 24th to 26th. 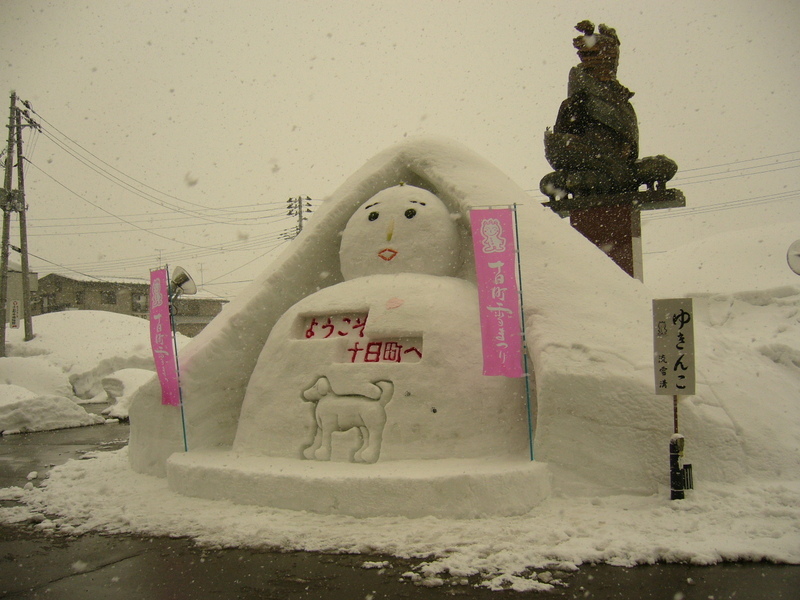 Tokamachi-City, in which Iketani and Iriyama villages are located, is very famous because of it’s heavy snow that is even described in social studies textbooks for elementary schools. 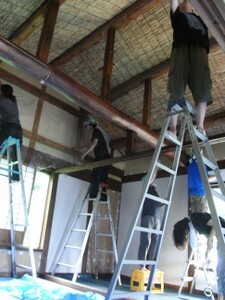 This time, the volunteering started the preparation for being coping with the heavy snow, a process called “Fuyu-gakoi”. The volunteers uninstalled guardrails and corner mirrors to let the snow blowers pass through, and volunteers planked around the Shrine to protect it from snow. In addition, the volunteers picked up firewood and cut it into a useful size. Although this is tough heavy lifting, the volunteers enjoyed doing this. On the other hand, there was a “Fuyu-gakoi” for apptite, too. New rice harvested this year was stored in cooler storages. The rice stored here will be delivered to “Yama-Shimizu” Rice admirers(!) all over the country. (To purchase this rice, please click here -- in Japanese only.) We, the volunteers, carried heavy rice packets to the best of our ability, then all we have to do now is eat it! It is time to relax. Apart from these tasks, we sorted black-soy-beans and threshed buckwheat, and so on. We had experienced the village’s lifestyle through these tasks, and with a laid-back atmosphere, enjoyable times past by quickly. When half of the harvesting was finished, suddenly a village man said to us, “ Do not drop the rice!”. “Hm? !,” We were frozen and then, started to look around on the ground. What we saw was that many straws were spread before us and some rice ears had been dropped here and there. As we, the volunteers, were finished up bundling the rice, we did not notice that we had dropped 1 or 2 ears of rice and had moved on. Surprisingly, about 130 grains of rice are harvested from one ear. Village men dealt with them very carefully, and picked up every dropped ear of rice. That was the moment when we felt the villager’s affection for their rice. After this incident, we continued reaping the rice carefully, trying not to drop even a single rice ear. After we finished the rice harvesting, we got into the paddy field with the village men and checked whether there we had dropped any rice. We checked the paddy field, around the paddy field and around the path where we dried the rice, looking very carefully. It was nearly sunset by the time the local people and the volunteers finished picking up the rice without any left behind. The next task was to dry all the rice we bundled under the sunshine. Villagers treat even a single grain of rice with extra care. To them, the paddy field is their property, and the rice is their treasure. We could feel the importance of the blessings of nature and the affection for every single grain of rice in those 3days. Said the men of the village. We, the volunteers, asked them many things and started reaping the rice by imitating them. I brought down a grain sickle with all my strength. I could not cut the rice with one swing like the villagers and needed to use the grain sickle like a saw, cutting the rice multiple of times. Then I was told, "Not like that, do it like this,” the village man advised me with a gesture. Soon, I managed to reap efficiently, and I continued cutting the rice with at a good pace. After 1 hour, my back and legss weres completely exhausted as if they were screaming. On the other hand, the village men, whom are 75 years old in average, were reaping the rice easily, rapidly and efficiently without saying anything. “The village men are extremely skillful!”, I thought. 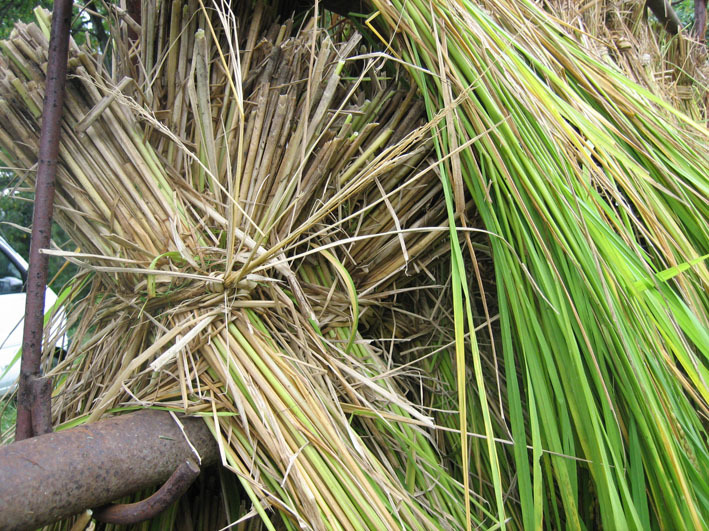 The harvested rice was bundled in 6 roots each by straws. First, 3 roots out of the 6 were put and slanted to the left. And then, the rest of the 3 were put on it and slanted to right. Finally, we put straws at a cross point. We repeated the flow. In my case, the method of tying was difficult and complicated, therefore although they told me many times how to do it, I could not tie them like they do. 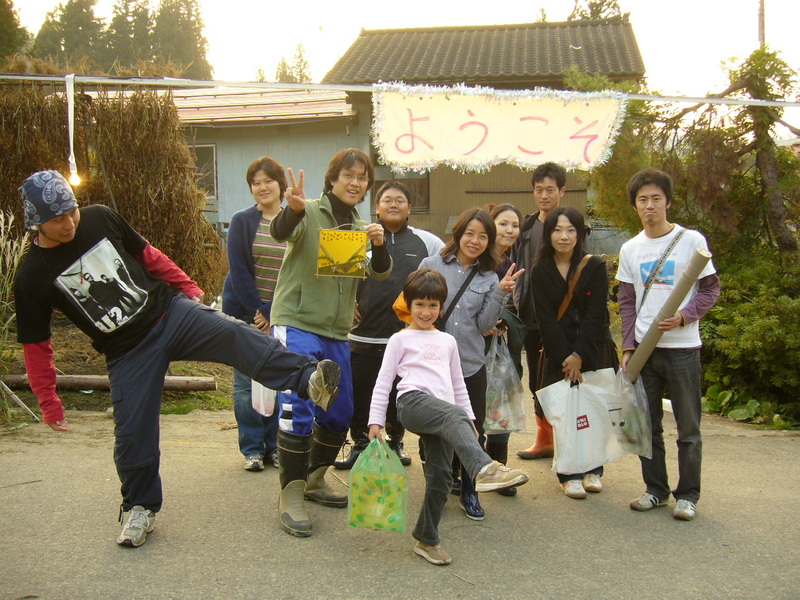 From on September 26th to 28th 2008, 20 young people of the age 20 to 30 got together in Iketani village, where the villagers are in their 70s. These young people are participants of “Let’s Go To Tambo!! Session 3”. This time is the last session of the 3-part series, harvesting rice in paddy field. The rice we had been planted with our own hands in May. They had golden ears and have now grown in a full-grown and strong way. We planted these in the spring, weeded at the paddy field during the summer. The rice which we had spent careful time to grow have now blossomed, and now it is finally time to harvest. I have never harvested rice! So I was extremely exited and headed to the Tambo with a grain sickle. The splendid golden rice field spread before me. There was hardly any time to be impressed, I walked into the paddy field in a hurry to catch up with the villagers, who had already started harvesting in the village. This time, the revitalization volunteering event was held from September 12th to 15th for 4 days and 3 nights, instead of for 3 days and 2 night, with taking advantage of the “Keirou-no hi (Respect for Senior Citizens)” day, which is a national holiday in Japan. This was the last session to mow the rice for this year. 8 participants held mowers and hand scythes and mowed along the fields with the villagers. We have been carried out mowing since this June. This time the climate was much more comfortable than the boiling sun in the summer. Although we worked in the rain, we completed it without any incidences. What we had been afraid of the most was injury. Especially blades of machines are spinning so that we have to be careful dealing with them. Mr. Sakane, the head of the village, said in the banquet that “I was relieved because there was no injured people despite the fact that I had worried about it the most. By the way, harvesting rice will begin soon. The next activity in Iketani and Iriyama is the last session of “Let’s go to TAMBO!!”. The rice planted in May has been growing steadily and is waiting for harvesting. Click here the latest news of the rice planted in the program of “Let’s go to TAMBO!!”. Iketani and Iriyama are sites for one of the largest production areas of “Uonuma Koshihikari ” which is high-grade rice in Japan. The 2008 Summer Edition of JEN’s newsletter included a flier about this rice. This year, the rice produced at Iketani and Iriyama was named “Yama-Shimizu-Mai”- which means “rice grown with clear water from mountains. 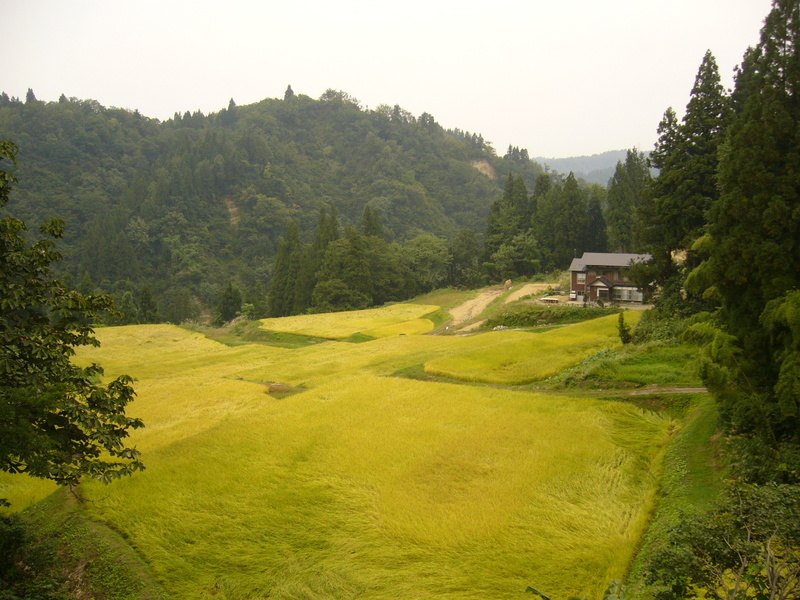 The flier included a photo of the scenery of a beautiful rice terrace in Iketani where the rice is grown. With this newly decided brand name, it is expected that “products of Iketani and Iriyama” can be emphasized. 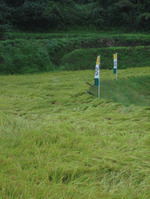 The rice that is being grown by farmers and volunteers will be harvested in autumn and be sold. Of course, the harvesting is going to be carried out as an volunteer activity. 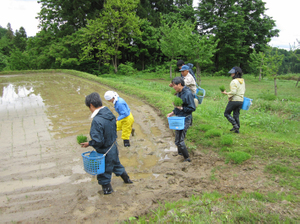 As those of you who joined weeding activity may know, the “Iketani & Iriyama” rice is grown with as little pesticides as possible. Therefore the rice is “safe and trustworthy”. Nowadays, people seek food which is “safe” and “domestic”. Yama-Shimizu-Mai is valuable rice which meet both of these criteria. 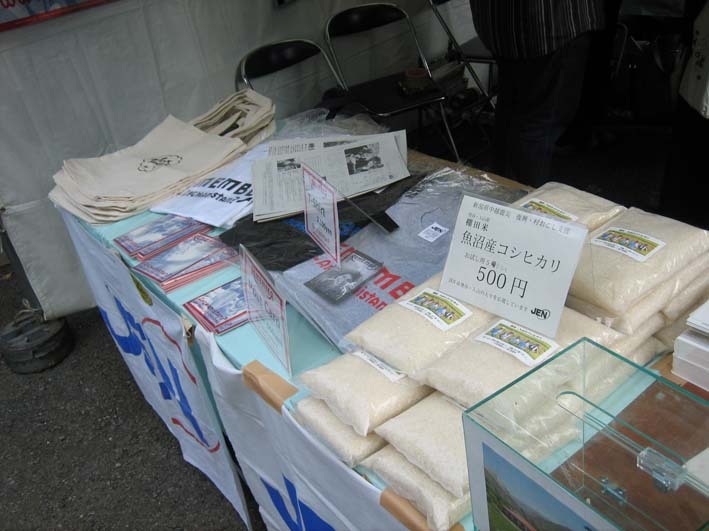 This April, JEN sold this rice at JEN’s booth in “Earth Day Tokyo 2008” held in Tokyo.Some customers who purchased this rice said “I bought this rice because I can support the village”. 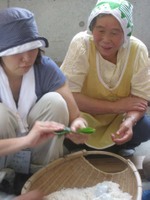 There are means of supporting the village not only by joining the volunteer activities but also by purchasing the rice. In JEN’s volunteer activity, a banquet for interaction and exchange between people in the villages and volunteers is held every time. The place for the banquet is the Iketani village Meeting House called “Minoru Ikedan (Blooming Iketani)” in the centre of the village. From morning to evening, after finishing the volunteer activity for the day and having dinner, we drink some alcohol or soft drinks with local people to foster friendships. Sometimes we are given a present by the local people. The present is that they sing for JEN volunteers the traditional celebration song called “Tenjin-bayashi”. This is an enjoyable time for us to be told various things about the village. In the party, the comments about the village and volunteer work were given by the volunteers through the friendly interaction between them and the local people. In fact, the conversation without any objective like this is extremely important. The people in the village are able to know about their own village in an objective matter through their impressions of the village and the toughness of work of agriculture. Accumulation of these ideas sometimes bring some ideas for developing the village such as “What should we continue to value about this village?”. In many ways, the interaction between the volunteers and local people is important. JEN would like people who will join the volunteer activity in the future to let the local people know about their impressions of Iketani in a friendly and honest manner. The Second Session of “Let’s go to “TAMBO(Paddy Field)”!! was held from 8th to 10th of August. In the peak of the summer in Iketani, weeds have grown densely around the “TAMBO”. Mr. Hashiba, who has been keeping an eye on the ears of rice in Iketani for several decades said, “The ears of rice in this period are most beautiful, just like women just before their wedding. We have to weed out to prevent the weeds from spreading diseases”. As a result of the best effort of 16 volunteers, under the strong sunshine, the view in the TAMBO has been cleared as you can see from this photo. At night, a starry sky observation class was held. Mr. Murakami participated as a teacher gave “students” friendly and in-depth explanation about the great triangle in the summer and satellites etc looking up into the night sky. 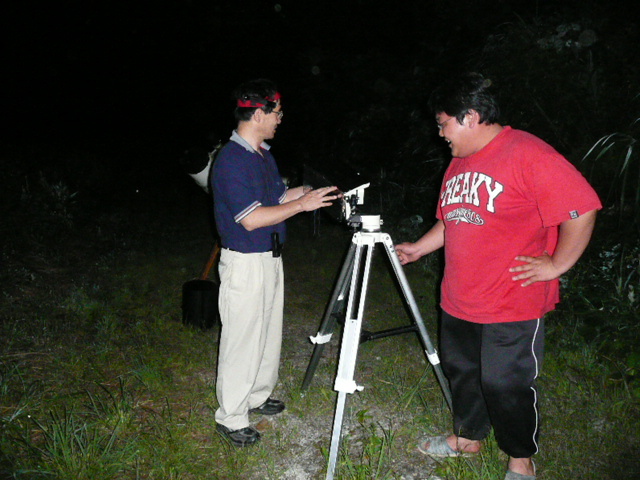 The students took turns observing the night sky through a telescope brought by Mr. Murakami. There were countless stars that are invisible to the naked eyes. It was a clear sky, so the students squealed in joy when they saw The Milky Way and a large number of shooting stars, which we cannot really see in the metropolitan area. The next “Let’s go to “TAMBO”! !” in September will include finally harvesting the rice, followed by Candle-Night. 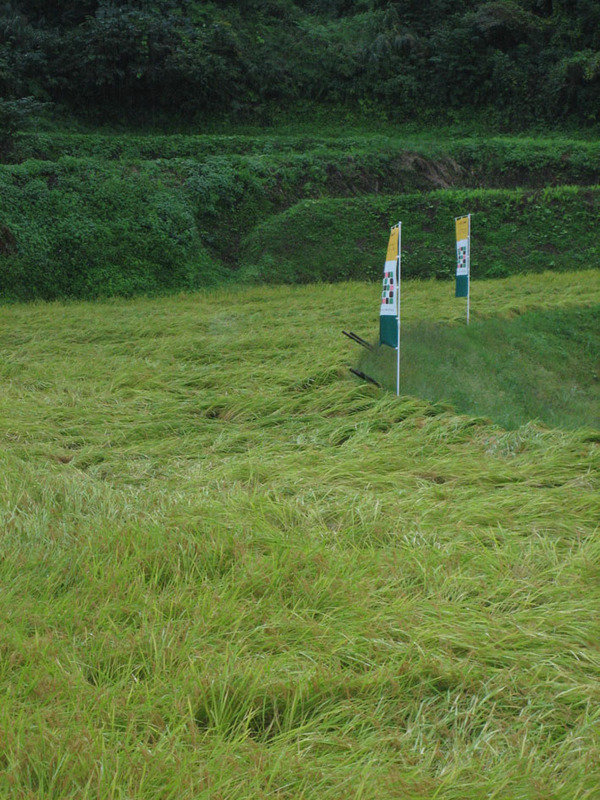 The rice seedlings have been growing steadily, so we look forward to harvesting them. We hope it will be delicious rice! The 3rd Village Development Volunteering Event was held from June 20th to 22nd, and 12 volunteers participated. The main activity of the event was clearing weeds. 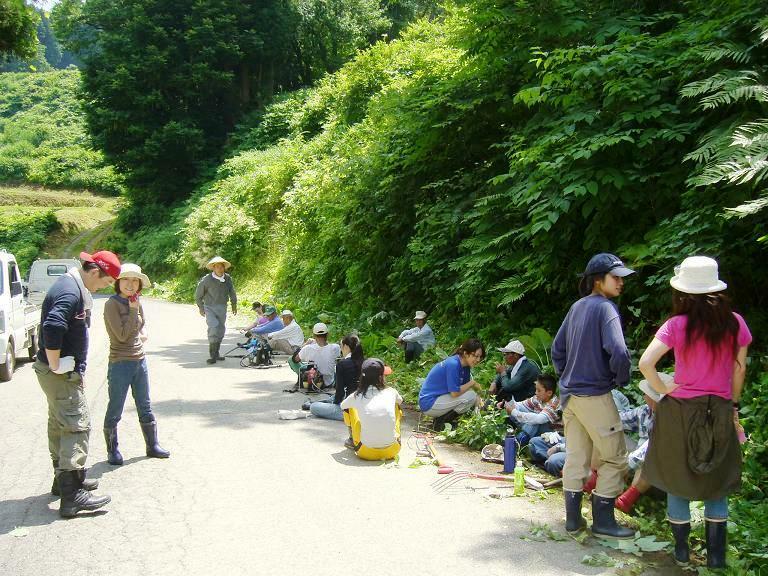 Weeding along the municipal and agricultural roads is quite labor intensive, and thus especially in a village such as Iketani and Iriyama which suffers from a shortage of labor desparately needs support from volunteers. This year again, a number of staff from Morgan Stanley have participated in this event. They had come to Niigata directly from their office just after they had finished their work on Friday. From the following Saturday morning, they had the pleasure of clearing the weeds under the scorching sun. Today, various people visit Iketani and Iriyama from all over the country. We are encouraged by the consideration of huge Multi National firms like Morgan Stanley towards such a small village. We hope that more and more firms will take similar interest. We would like to continue developing a network which links Iketani and its outside world. We look forward to participation and support from various people. We hope that together we will continue to create a flourishing community in the future. 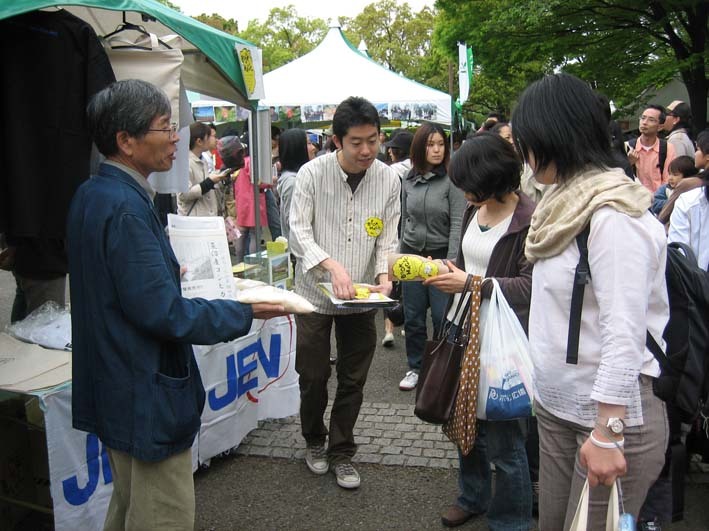 JEN sold rice of Iketani, Iriyama of Tokamachi-city in Niigata, at the booth on "Earth Day Tokyo" on April 19th and 20th. Seventy six packages of rice, 750 grams per package, were sold thanks to the promotion by supporters of JSC(JEN Supporters Club). Mr. Takahashi from Tokamachi city development committee, came to Tokyo and participated the event, and raised his voice together. The customers bought the rice saying that “I can support for the earthquake disaster”, “I want to do something for the settlement”, “Because it is delicious rice made in Uonuma” and so on. 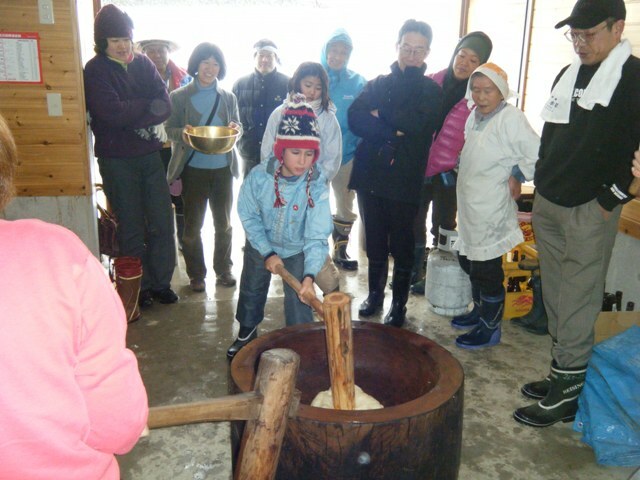 Some people said that they want to participate in volunteer activities after they knew about the volunteer activities in the village of Iketani from the rice. What we learned from the event is that there is still room for improvement for how to sell rice for the Committee and Sales Promotional tools in various sites and ways are important. 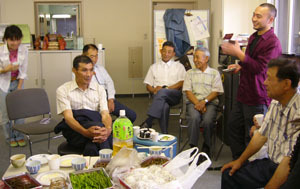 Ideas and cooperations are needed from the volunteers in order for the committee to sell rice in Tokyo. We look forward to your supports for the activities of the village of Iketani in Tokyo this year. We have successfully completed the four sessions of Snow Busters this year. This year, we established the ‘Snow Removal Training Hall’, and all volunteers received training allowing them to go up onto the roofs of houses to remove the snow. The answer to this issue will not come easily. However, what is important is the new sentiment in the air, the hope that this year will be one in which the village people will consider and act for the future of their village. 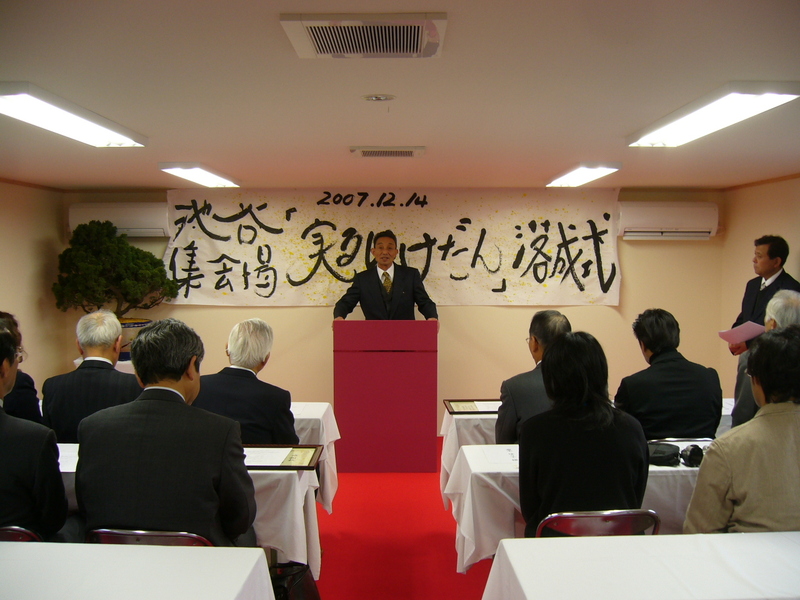 On December 14th, a ceremony was held to celebrate the completion of the re-building of the Iketani village Meeting House. 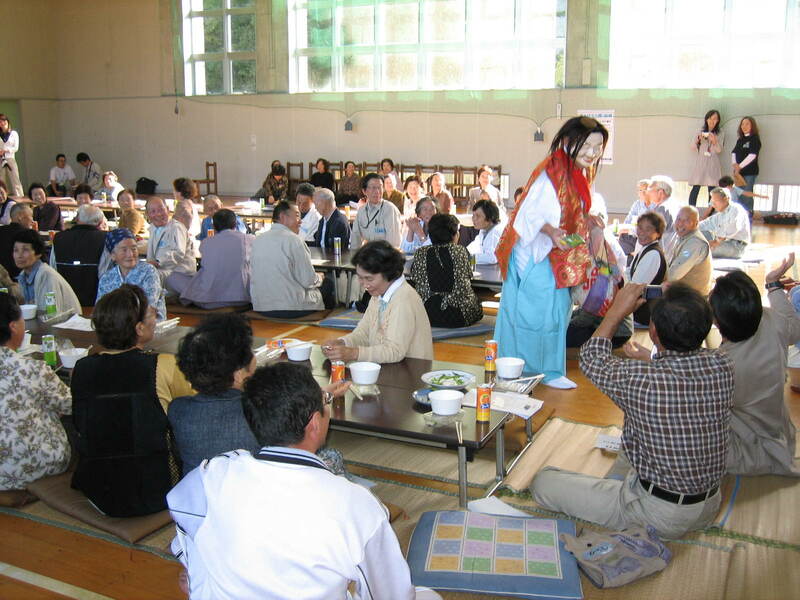 Tenjin-bayashi(*1) was performed at the beginning of the ceremony and during the banquet, foods from the local area were served. 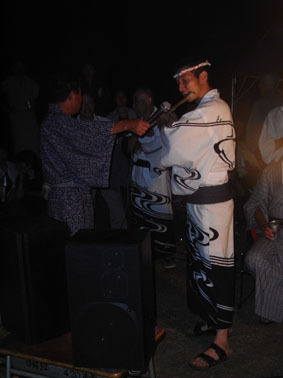 It ended up being a wonderful ceremony filled with the character of Iketani village. Surface damage caused by the Chuetsu Earthquake has now mostly disappeared after the completion of repairs to the meetinghouse. The meeting house is named “Blooming Iketani”(Minoru Ikedan)(*2) as Iketani has now begun selling rice and local special products. In this way, the path of recovery in Iketani/Iriyama has also begun. “Snow Busters”, as everyone already knows, is starting in January. Please come and visit the re-built Meeting House and see how village residents are taking steps forward. (*1)Tenjin-bayashi is an old celebration song of Iketani. Usually it is sung after two or three drinks during the banquet. (*2)Ikedan means Iketani in the Iketani dialect. Today, people still call Iketani, “Ikedan” with an affectionate attachment. Just as we thought it was going to be a late winter this year, all of the sudden it turned into a winter picture. Snowｙdays have been increasing. The preparation for the completion ceremony held for the renewal of the meetinghouse, which is to be held mid-month, is almost ready. 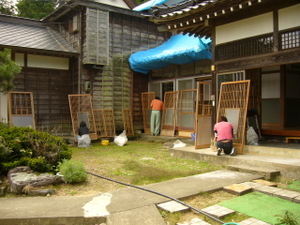 The meetinghouse in Iketani was damaged by two earthquakes, however, it is finally it is getting repaired. People will dress in formal clothes on the day of completion ceremony. For this rare formal ceremony, people are filled with hope and also a little anxiety. 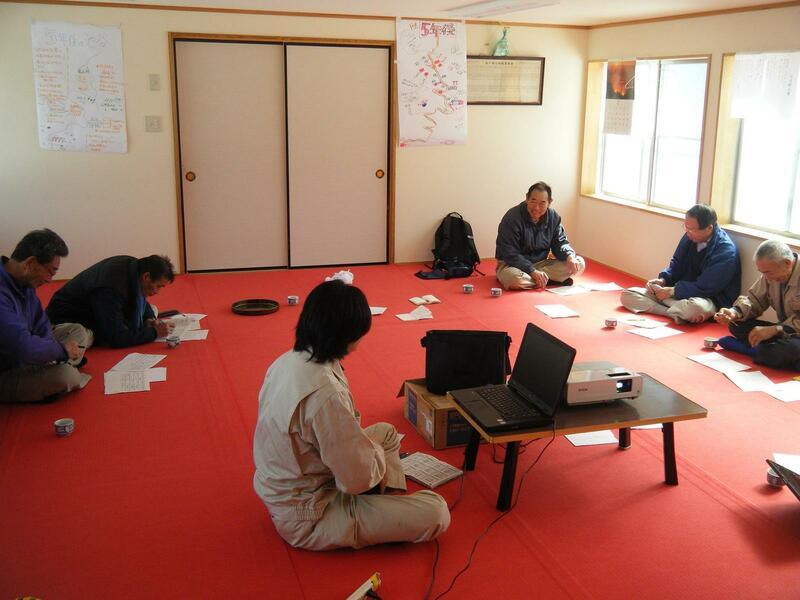 Right now, a workshop entitled “Iketani/Iriyama from Now On” and “Discussion of Important Matters” is held couple of times a month in Iketani/Iriyama. Last time, we talked about the completion ceremony and an inspection tour of progressive areas. Things confirmed at the workshop included the policy: “When doing an event, divide up the roles but put one person in charge”. When doing an event in the village in the past, because there are only a few people, people did things together without putting anyone in charge. However, we have heard that in other area's village revitalization was most successful using this method of putting a leader in each role. Villagers agreed with this and chose the leaders for each role of the completion ceremony. When doing bigger events from now on, it will be important to cooperate with various groups and people. In order to do so, it is important to put someone in charge and administrate systematically. JEN will further support in any way possible the Tokamachi Regional Development Planning Committee to become more systematic and efficient. On the first day of the Harvest festival volunteer project, all the volunteers helped with sewage improvement of the branch school and prepared the tree-planting ceremony. Since we planned to plant the trees where we did last year, we first disposed of the grass, mowed and finally made 100 holes. We created a fantastic board for the Harvest festival using the idea of decorating real radishes and carrots. On the day of the Harvest festival, we all prepared for it by helping to cook miso soup with pork and vegetables, arranging Mr. Hashiba's residence for the symposium and bringing up some tables. 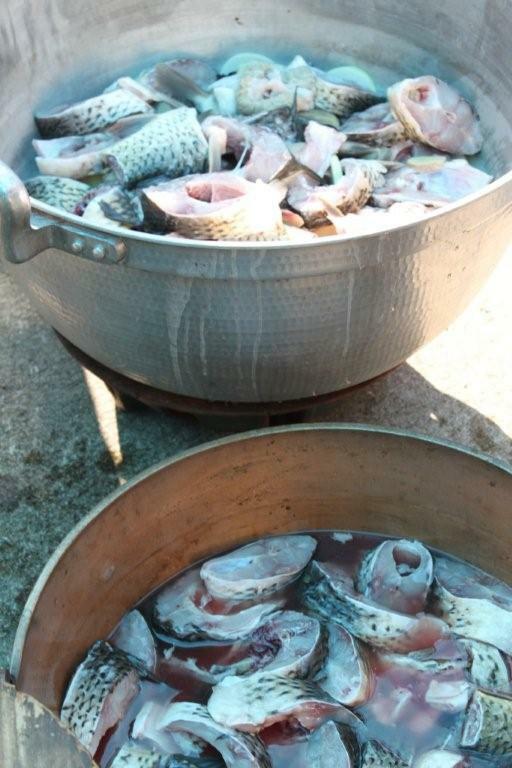 We also created bamboo skewers for broiling iwana (mountain trout) with salt and bamboo cups. Finally, the Harvest festival started in the afternoon. First of all, we did treasure hunting. This is an annual event, but surprising treasures still remained in Iketani and Iriyama, which the villagers didn't realize existed. 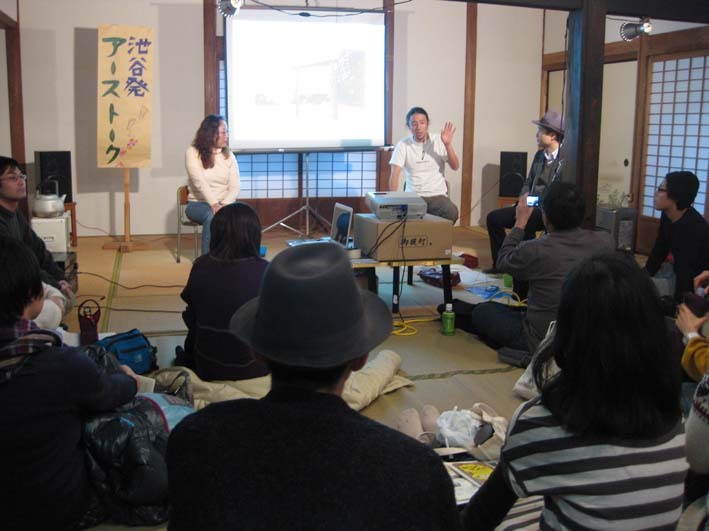 Next was the Symposium "Let's think about the future of Iketani and Iriyama": this was the first symposium in the village. We had Professor Nakajima (Tanada Network), Mr. Nagasaki (Chuetsu Fukko Network), Ms. Saiki (Toka-machi city hall), Mr. Tsukura (Iketani), Mr. Yamamoto (Toka-machi Regional Development Planning Committee) and Ms. Kiyama from JEN as panelists. A heated debate was conducted. There were many constructive comments like "Iketani and Iriyama's rice is the No.1! Next year, we are going to make a field with the volunteers!" Visitors also gave us many ideas. 8 people from Betsuyama district of Nishiyama-cho where the Development Committee and JEN supported in Chuetsu-oki earthquake joined the event. Both relationships have deepened since the last "Genki-Takuhaibin-Event". "We sometimes face difficulties but let's keep it up, Ikedan (nickname of Iketani and Iriyama)!" We planted both fifty maples (Itaya-Kaede) and Guercus Serratas (Konara) the next day. We look forward to seeing them grow and they will be our responsibility. 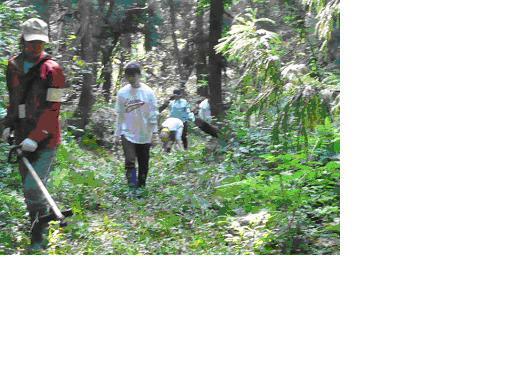 We felt relieved after the event, and all of us went to the Beech Forest to relax. This year's "Village Development (Mura-Okosi)-volunteer event" was over, but we are planning our first Snow Clearing Volunteers to stay at Iketani branch school next January. 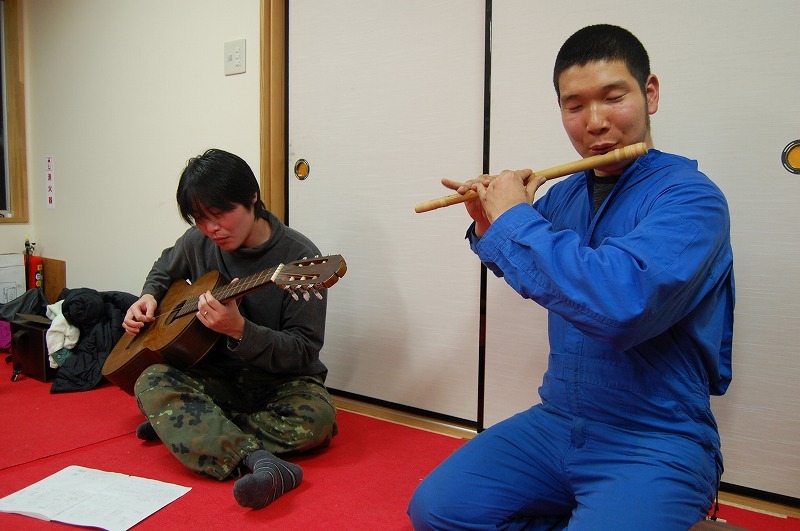 We would appreciate your help to Iketani and Iriyama in various ways. Next year, we are going to make more plans so that the volunteers can make an even more significant contribution. We thank you for your attention, as always. 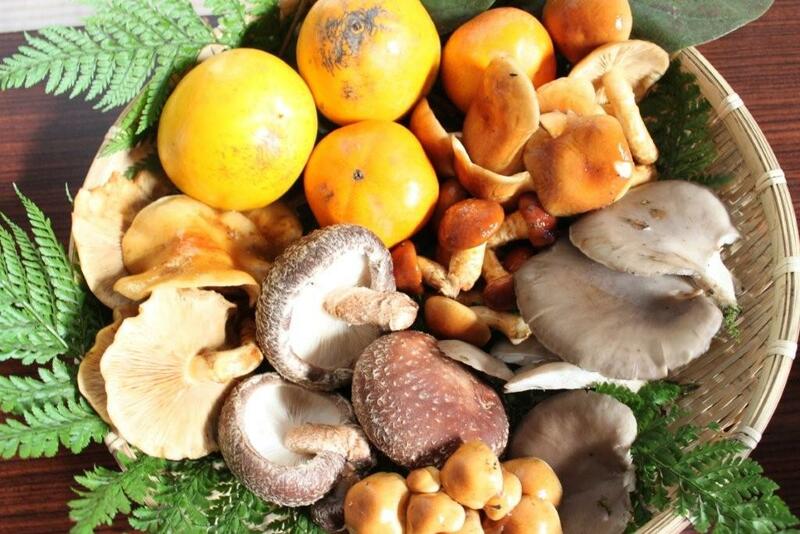 The season of the Harvest festival has come this year! We will have a lot of events like treasure hunt and art events.If you would like to join as a volunteer, please choose to stay either 3 nights and 4 days or 2 nights and 3 days. Visitors on the day are also welcomed! 1600-17:30 Symposium (Theme: Look back at the three-year activities in Iketani/Iriyama after the Great Chuetsu Earthquake, and think about the way to go for the villages to survive. We papered the rest of the sliding doors and prepared for and held the networking event. The weather was on our side all the time, and we could enjoy the fine autumn weather. “Ohanasi-tai” started on August 3rd. We experienced so many things and gradually could gain the understanding of the Betsuyama people in order to have a good relationship with them. When we started the preparation for the networking event, we assumed 60 people would come. However, to our surprise, over 120 people came and joined us. The meal we prepared was only just enough for them. Our aim is that through mutual effort, the people from Betsuyama and Iketani/Iriyama in Tokamachi, and volunteers, hold this networking event. It should not be a one-sided approach. On the morning of the networking event, the tripartite prepared the meal vigorously. For the entertainment of the party, people from Betsuyama sang festival Mai and music, people from Tokamachi danced around to live music, “Ohanasi-tai” volunteers sang and performed, while people from Katakuri-no-sato played a violin. All of us played a part and communicated well with each other, we believe. Also, people from Iketani/Iriyama in Tokamachi damaged by the Great Chuetsu Earthquake three years ago cheered up people from Betsuyama. They invited Betsuyama people to the Harvest festival held in November 3rd in Iketani/Iriyama. This was the last activity of “Ohanasi-tai” but we would like to keep assisting Betsuyama in the same ways as we support Iketani/Iriyama. Your continuous support to the Niigata Chuetsu Earthquake would be greatly appreciated. We would like to take this opportunity to express our heartfelt appreciation for all your big supports to JEN “Ohanasi-tai”. Thank you. This time we papered sliding doors (SHOJI) at the village center and residences. The members were good at putting papers on sliding doors and we were able to finish so fast and the Town Chairman was very surprised. We put approximately over 300 papers on the doors, this time in the Betsuyama area. We did not expect that we would paper sliding doors in the disaster area when we started our activities. We tried to support effectively while prioritizing mental health care as the most important thing. So, while we cleaned the houses, we tried to make people happy, chatting while putting on the papers and making close relationships with the afflicted people like one big family. After all, we became “Shoji-hari-tai”, not “Ohanasi-tai”. 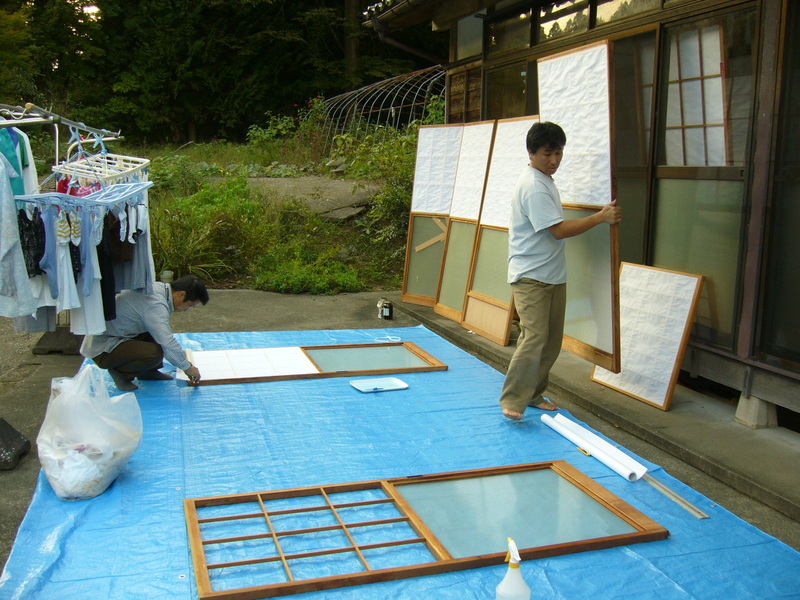 We do not know how much we could contribute to the removal of blue sheets from Betsuyama, but would hope at least we were able to show support by papering slide doors as a visible activity of reconstruction. This time, we helped with the moving process by we re-papered sliding doors (called Shoji), moved the straw mats (called Tatami). 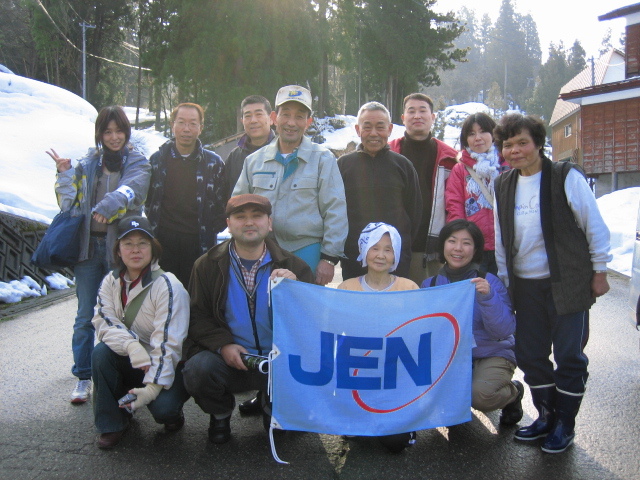 Thanks to the effort of Ohanashi-tai members, JEN Ohanashi-tai started being recognized in the Betsuyama area. Local people told us, “Thank you for your constant efforts in Betsuyama” even though some of them have not been helped by Ohanashi-tai. This time, we re-papered the Shoji with a lady in a family. Her skill for papering Shoji was absolutely fantastic. We had no doubt that our own skill must have improved as we observed her excellent skill. However, the next day, we visited another family and started re-papering the Shoji full of confidence, and we realized our actual skill for it…. With our effort, we finally managed to complete re-paper all the Shoji by sunset. In another house, there is elderly person living alone and they asked to clear up TATAMI. They seemed happy with not only our activity but also having a cup of tea and chatting with us. The earthquake must have been tough experience for elderly people living alone. They are frustrated and there is no person to ask some advice and to moan. Furthermore, their families do not live closer to help to tidy up their confusing mind. We, Ohanashi-tai, have only limited time to talk to them. But we will continue our activity and we wish our activity will help them, even if it is a little help. The First Dialogue Friends have been sent! From August 3rd to 5th we had carried out the first operation of the Dialogue Friends, which is part of our "Chuetso-oki earthquake volunteer program". 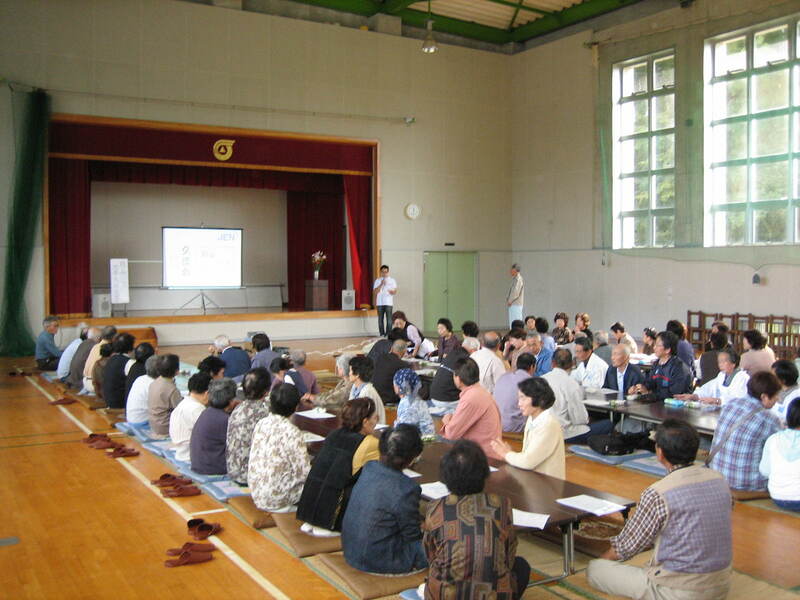 The nine people who took part of this operation began their activities in the community center of Betsuyama where many people are taking refuge. They helped with clearing and cleaning areas. They also visited individual homes to help with fixing the gardens and other places damaged by the quake. After all that, they took some rest and shared tea with the people at the refuge center where they were welcomed warmly even by those who haven't had a sip of warm tea since the earthquake. There are also some people who hesitate to have strangers like us, and some others who have hearing disabilities, living at the refuge center. Still, as soon as we began to serve tea and played some games with them, they approached and happily joined us. The streets outside of the refuge center show how fast the restoration works are being conducted. That is typical Japan. But on the other hand, we can also see a welfare bus that serves as the legs for all of the elderly. In spite of all the portable gas stoves provided, the supplies bought, the medicine given, there is no way to get to the public baths away from the refuge center. A 90 year old lady who was born, married and raised her children in Betsuyama, has lived alone since her husband died 20 years ago, until the earthquake happened. She lived here for her entire life, and to see buildings from as far back as the Edo Period fall down. She mentions that she is now living at the refuge, but still goes to her vegetable farm everyday. She is worried about the possibility of moving into a temporary shelter within walking distance from the farm, but at the same time she reckons with a smile that hers are small worries if compared to a war situation. We were supposed to go help these people, but were overwhelmed by their strength. We are thankful for all we learned together. Recruiting volunteers for the Chuetsu-oki earthquake. 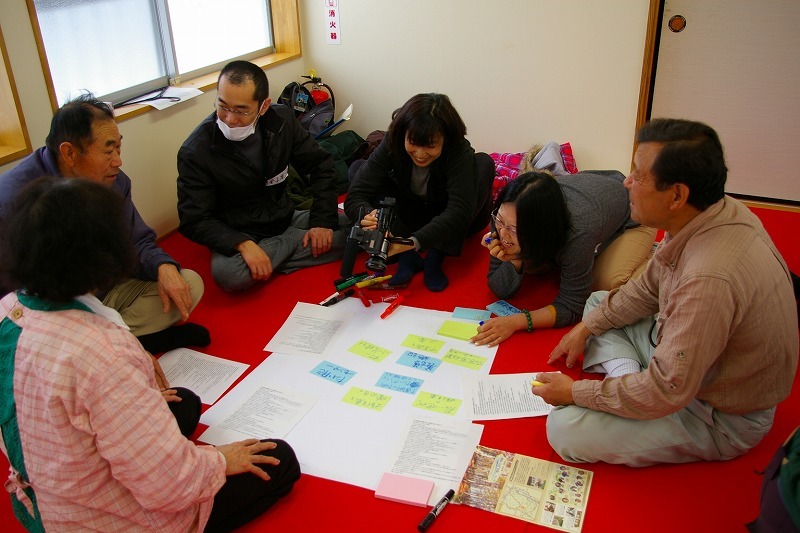 Getting on the move to respond to the emergency, the Kashiwazaki Social Welfare Conference in Nishiyama has began to assess the medium-to-long term needs of the earthquake victims. Based on this assessment, the "psychosocial care" project will be carried out as a major project by the Toka Machi Welfare Conference, which belongs to the jurisdiction of Iketani (Toka Machi), where JEN has worked since 1994. All interested applicants who want to participate in these volunteer activities are welcome to apply here. JEN is also collecting donations to assist with these emergency efforts in Niigata. * Please specify if your donation is for the purpose of assisting the “Chuetsu-oki earthquake emergency”. The day at Nishiyama's volunteer center starts with the head of the office greeting us energetically, "Good morning! Let's do our best with a smile in our faces again today!" Then, at around 5 o'clock, Mr. Abe gives a small speech like "according to… the English science magazine….” etc, and the day ends with everyone paying regards to the day's efforts. Mr. Abe also told us that the "Ishiji" (A region in northern Nishiyama that faces the Sea of Japan) sunset is the best one in all of Japan. He recommended the volunteers that arrived from all over Japan to take the chance to enjoy the sunset at 7 o'clock. The exact place where the sun sets is thought to be the epicenter of the Chuetsu earthquake. On your way there though, you must pay enough attention because the road is in a fairly bad condition due to the quake. In spite of the tension and tiredness of the day's hard work, Ms. Tanaka and I decided to follow his recommendation and go have a look. Sorting things out on the way, we managed to arrive at Ishiji at 7:05. The most beautiful sunset in Japan, with such a crimson sun setting in the horizon, was breathtaking. At this point, I am reminded of how much I want to help people who are in trouble… I used to work at a corporate company, when I visited the Thai island of Phi Phi for monitor the progress of reconstruction efforts, and felt helpless. Today, those feelings came flooding back. The Nishiyama volunteer center has begun its operations, and from 9 AM volunteers will begin responding to requests for help from the quake’s victims. Between yesterday and today we received 41 requests for volunteer assistance, and 81 volunteers have been mobilized. "I need some help to fix the roof that has fallen off", "I need help to get to the hospital for my medicine", "While I fix the house I want help with my small children", etc, are some of the requests we receive daily. Until today, volunteers from outside of the Province where not accepted, and thus, we were unable to respond to many requests for help. On 23rd of July we expect many volunteers from Kashiwazaki, and we are aiming to respond to all needs with flexibility. (Above) Matching the needs of the victims with the volunteers is from today being conducted in tents. (Below) The interior of a collapsed house. 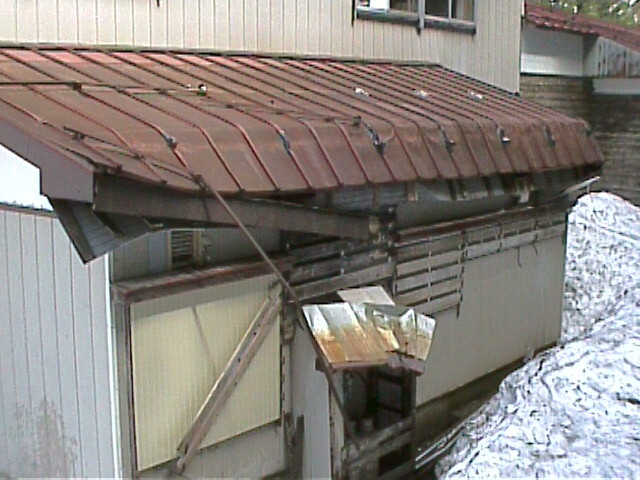 Inspections of half and fully collapsed houses were held in Nishiyama. Assistance is urgent. JEN to Begin Assistance Operations. On the 19th of July, JEN carried out inspections in the region struck by the Chuetsu-oki earthquake. In coordination with the Toka Machi Regional Development Committee (Chairman Mr. Yamamoto), we decided to support the creation of a volunteer center through the Kashiwazaki Social Welfare Confernce in the town of Nishiyama. Our inspections today were carried out at the village of Kariwa, and Nishiyama town, where 1500 and 2000 families live, respectively. The main need in many affected areas is water, which is insufficient for daily purposes and hygiene during this hot season. The recently created volunteer center of Nishiyama town will mainly respond to the needs of these 2000 families. Throughout the morning, Keiko Kiyama (JEN’s Secretary General), Ai Tanaka (Program Officer), and Hiroshi Yamamoto (The Toka Machi Regional Development Committee’s Chairman), assessed the situation in Nagaoka, Kashiwazaki, and Kariwa, and also participated in hearings at the volunteer center. From this evening they will continue carrying out inspections in unassisted areas. JEN is also collecting donations to assist with these emergency efforts in Niigata. We appreciate your cooperation. Please specify if your donation is for the purpose of assisting the “Chuetsu-oki earthquake emergency”. Niigata Chuetsu-oki earthquake: JEN has began local inspections. JEN has dispatched an inspection team to assess the situation in the region where the Chuetsu- oki earthquake struck on Monday the 16th of July. We will carry out the inspections in Kashiwazaki and other areas where emergency assistance is difficult to reach. Then, based on our analysis of the situation, we will use the experience built up over the years in Niigata to provide flexible and appropriate assistance to meet the people’s needs. We send our highest regards to the people who suffered the Niigata Chuetsu-oki earthquake. When the earthquake struck at 10:13 am on the 16th of July, nine volunteers belonging to one of JEN’s programs in the Iketani and Iriyama areas were in the process of learning how to weave “zori” traditional Japanese straw sandals. Even though the earthquake was quite strong there weren’t any collapsed houses or significant damage, and the villagers and volunteers were unharmed. Services on the local railway; Hokuhoku Line were suspended, so the volunteers were taken to Echigo Yuzawa station, and returned home safely. The Toka Machi Regional Development Committee’s Chairman, Mr. Yamamoto, assessed the situation at neighboring Iketani and Iriyama, and stated that the damages did not appear to have reached their rice fields, crops or roads. After we verified the situation at Iketani and Iriyama, we are considering collecting data in the Kashiwazaki region, which suffered the most damage, and looking into the possibility of extending our assistance there. 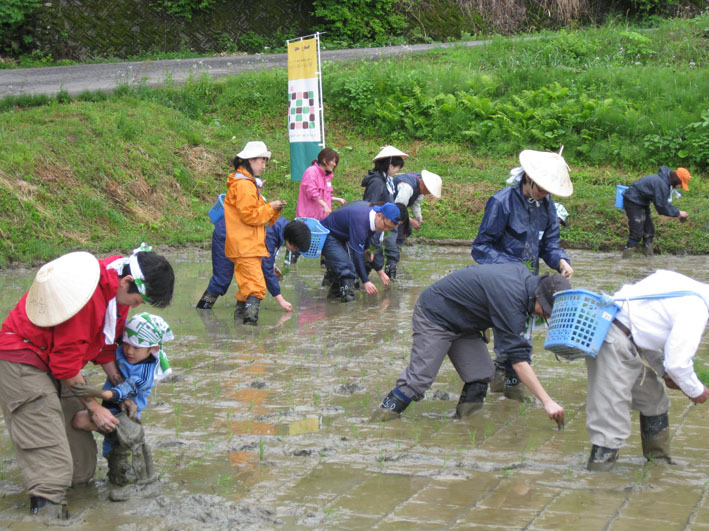 Join in agricultural activities surrounded by the beauty of nature in Iketani village! ※ Travel fees are at the expense of each participant. ※ Parking for private cars is available in the village. Car pool among participants is welcome. restoring local infrastructure, supporting the livelihoods of the elderly, bush clearing and farming, preparing and participating in community festivals in summer and autumn. 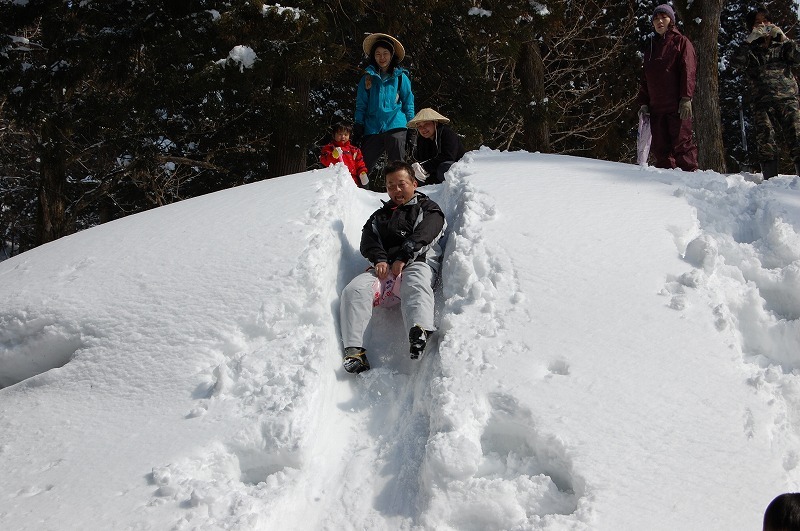 ※ Activities depend on the weather and both seasonal and local needs. ※ Dinner on the first day is excluded. ■ Belongings: cleaning cloths, work gloves (non-slippery), rubber working boots, long-sleeve shirts, a hat, a mask, a raincoat and other clothes for farming activities. ※ Boots can be borrowed in certain conditions. ■ Deadline for application: Maximum of 15 persons each session (First come, first served). <1> Download「application_form.doc」をダウンロード Fill in the form and send it to JEN's Tokyo Headquarters by FAX, E-Mail or Post. ※ Before sending your form, please call JEN to ask about the availability of places, as some sessions may already be full. <2> JEN will call you back to inform you of bank/postal transfer. <3> Your reservation will be confirmed after the bank/postal transfer. ■ Meeting point : The West Gate of the Tokamachi Railway Station, Tokamachi City, Niigata. JR Line and Hokuhoku Line are available. ※ JR Line stops at the East Gate, and Hokuhoku-Line at the West Gate. Participants coming from JR line should kindly come over to the West Gate. ※ Participants coming by private car kindly park at the station and come up to the West Gate. ※ Projects in Niigata are organized in collaboration with the Tokamachi Regional Development Committee. a small village surrounded by beautiful mountains? Local, experienced villagers will give you insight into their daily village life. Full board and lodgings are available in the JEN Centre, a former school restored for visitors. Japan’s best brand rice produced in this region. ※ Participants cook in rotation. 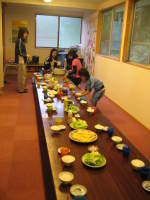 ※ Kindly ask in advance if you would like to bring preschool children. <STEP 1> Download the application form. Fill in the form and send it to JEN’s Tokyo Headquarters by FAX, E-Mail or Post. <STEP 2> JEN will call you back to inform you of bank/postal transfer. <STEP 3> Your reservation will be confirmed after the bank/postal transfer. ■ Meeting point: The West Gate of the Tokamachi Railway Station, Tokamachi City, Niigata. You can take either the JR Line or the Hokuhoku Line. ※ The JR Line stops at the East Gate, and the Hokuhoku-Line at the West Gate. Participants coming from the JR line please come over to the West Gate. ※ Participants coming by private car please park at the station and come to the West Gate. Car pools among participants are welcome. Please note that there are no private rooms in the Centre, men, women and children share accommodation. Sleeping bags are provided. Letters arrive in the village of Iketani from around Japan. People who ordered rice from the village send grateful messages to farmers, sometimes with smiling pictures. Those warm messages circulate through the village on their community bulletin. The farmers are delightful to learn that the rice they had raised with the utmost care has brought happiness to people around Japan. 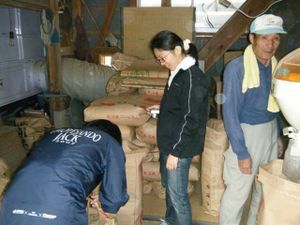 One of the purposes of the direct distribution of rice from Iketani is to create a link between farmers in the small village and people in big cities. Since January, customers receive not only rice but also “Rice News”, a handmade newsletter from farmers. Let’s write a letter to the farmers! Spring is approaching day by day in the village of Iketani. As the thaw set in, people in the village begin to prepare their rice fields. Their busiest season starts in spring and continues until harvest in autumn. 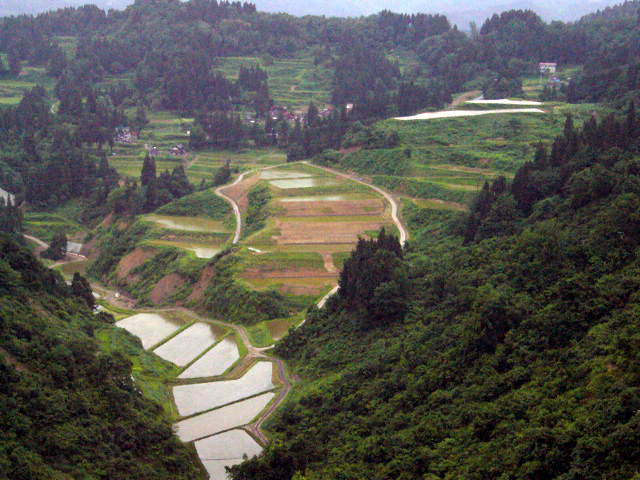 Having had little snow this winter, people are anticipating water shortage in coming summer when rice thrives the most. Rice is the greatest treasure of the village. People are planning to plant rice earlier in order to protect their treasure from any possible damages from the water shortage. JEN will follow the village’s needs and organize agricultural volunteers flexibly. In the meantime, JEN is planning to enlarge volunteer activities as “village-revitalizing volunteers”. The new volunteers would not only participate in agricultural activities in the depopulated village but also reanimate the village’s treasure as whole, such as, beautiful nature, experienced agriculture, and rural history and tradition. Kindly wait for JEN’s homepage to update for further details about new volunteers! 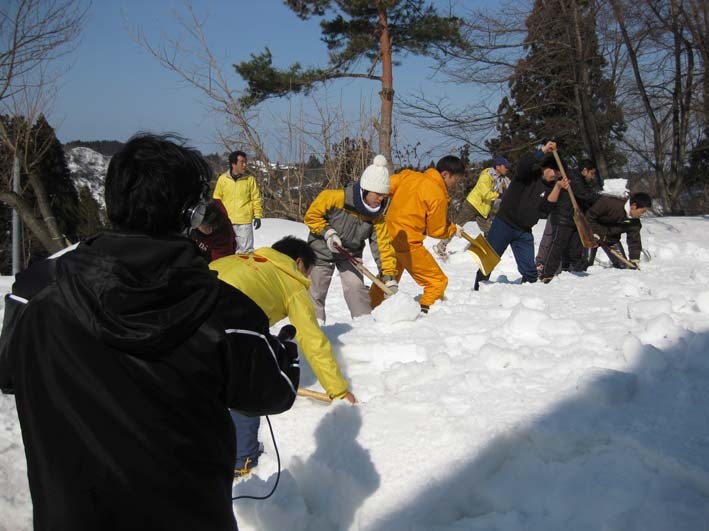 Snow clearance volunteer and homestay in Niigata! Let’s think about boosting the village economy. *The activities may be changed, according to the weather or other conditions. *Please bear the cost of the traffic expenses to the field. ■What to bring: gloves (waterproof), long boots, outfit for cold weather (waterproof), towels, change of clothes, copy of insurance card. ※Please ask if you need boots. ■Deadline of application：Until spaces are filled. ※ Spaces may have been filled. Please call us before you send an application. We will then inform you where to make your payment. After we confirm your payment, your application is determined. If you are late, please contact us. The times may be changed. We offer courtesy car to Tokamachi station. *If traveling by car, please park in the parking place of west or east exit and come to the Hokuhoku Line’s Gate. *We are also seeking experienced volunteer registrations in snow clearance for urgent heavy snow. Please let us know if you are interested. 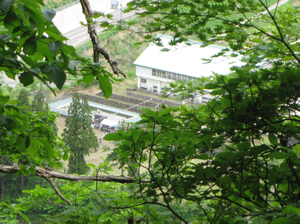 *Niigata project is operated by Niigata cooperation of Tokamachi-shi regional development executive committee. From the 14 - 15 of October, 4 employees from Morgan Stanley, a foreign-affiliated company in Tokyo, visited Iketani again since their first visit of 3rd Niigata Agricultural Volunteer Program. They revisited Iketani to see how big the sweet potatoes grew since last June. Those who wish to contribute the Earthquake affected people in Iketani, JEN is seeking Volunteer during the winter (Jan 2007 onwards). Further inquiries, please send the email to info@jen-npo.org. Branch school in Iketani had renovated! JEN center in Iketani branch school “Yama-no-manabiya” has renovated with assistance by donation of Japan Post. The roof of bathroom with broken eave because of snow has repaired and decrepit (almost decomposed!) floor of toilet and fluorescent light fittings has changed. We moved a step closer to recovery of the school. We will continue improving the branch school and we wish more volunteers visit Iketani. 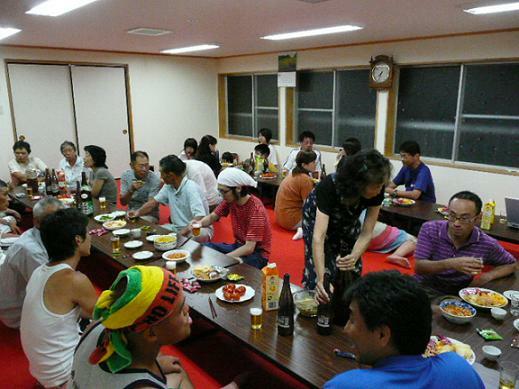 The fourth round of Niigata volunteer activity was held from July 14 to July 17 for four days and three nights. In spite of the continuous rain for four days, all of the participants succeeded in finishing the planned practices well, feeling full of health. 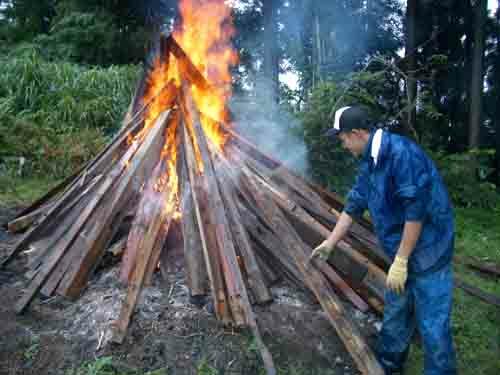 They burned lumber and pieces of furniture in order to dispose of collapsed houses as well as cut grass, cleaned up the fallen trees in the rain. Everyone did work getting sweaty because of an extremely hot fire. There were also held so many events such as a watermelon splitting, a barbecue and appreciation of fireflies in addition to agricultural tasks! At the third night they communicated with the locals until midnight, drinking tasteful Japanese sake together. The four people of the twelve participants have applied again to the volunteer activities within the year. Everyone seemed to be fascinated by appeal of Iketani! "Back then, we used to deliberately leave the roads in gravel to prevent outsiders from coming in. Today, we have volunteers coming to help from all over the world, and I feel I need to adjust my way of thinking to today's flow. Iketani has become international now, too." 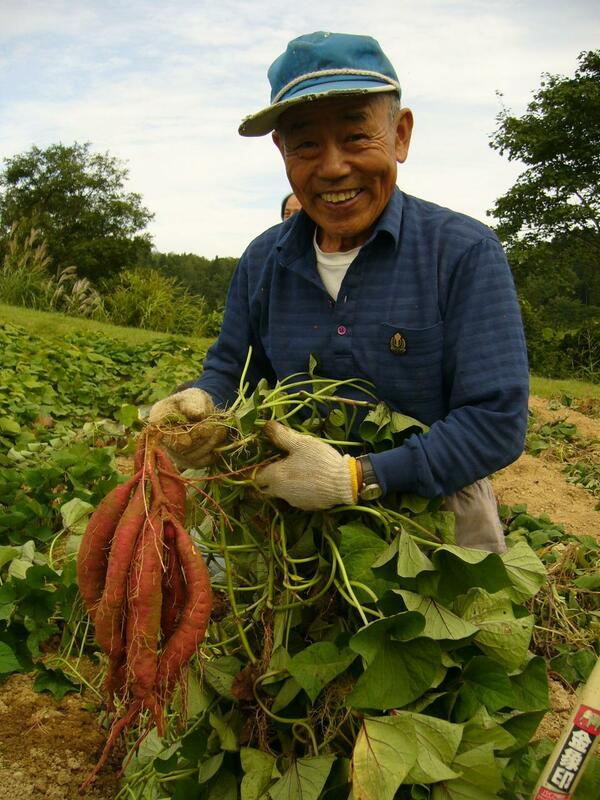 This is what one Iketani villager told us during the 3rd Niigata Agriculture Volunteer Program. 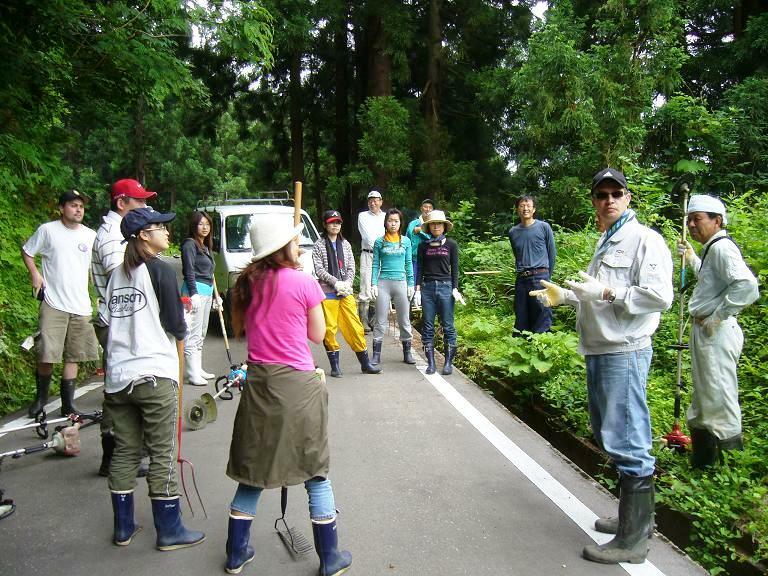 From the 2-4 of June, 15 employees from a foreign-affiliated company in Tokyo engaged in volunteer activities at Iketani. Accepting such participants was a first for both JEN and the people at Iketani. 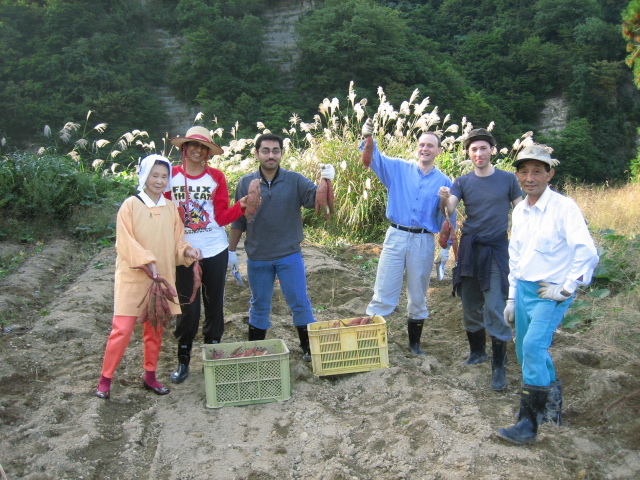 American, Indian, and Romanian nationals helped plant rice seedlings, as well as 7000 seedlings of sweet potatoes. The participants worked at an unbelievable pace, completing work that would usually take 2-3 days for the elderly villagers, in a mere half day. 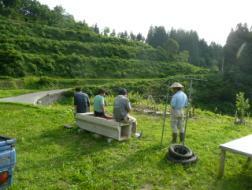 Said one participant, sharing a bottle of sake with a villager: "Iketani is such a special place. This was the most fun weekend I have spent since coming to Japan-I definitely want to come back." Delicious Rice, Delivered to Your Doorstep! 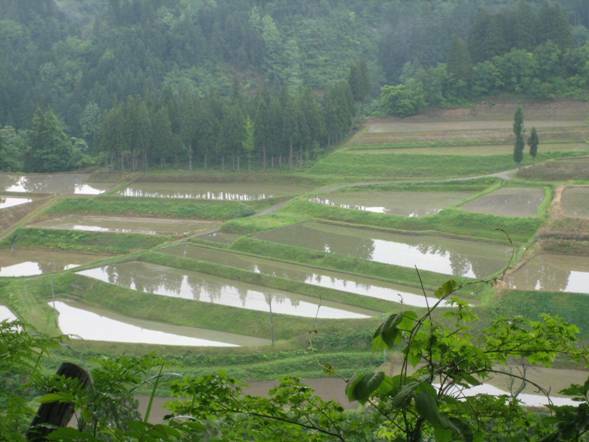 Koshihikari rice grown with much care and attention, using springwater from the hills of Iketani & Iriyama. We will deliver them, freshly milled, right to your doorstep. The shipping costs shown above covers the South Tohoku, Kanto, Shinetsu, Hokuriku, and Chubu areas. Hokkaido: 545 yen, North Tohoku (Aomori, Iwate & Akita): 105 yen, Kansai: 105 yen, Chugoku: 210 yen, Shikoku: 435 yen, Kyushu: 545 yen, Okinawa: 1,045 yen. Please download the application form from 「Moshikomi.pdf」をダウンロード , and fax it to the below number after filling it out. We will then inform you where to make your payment. Payment is required in advance. We will consider the contract complete once we have confirmed the payment. Please be aware that due to limited supply, there may be shortage of stock. On the 14th of June, some locals from the Iketani and Iriyama districts, where our Niigata projects are currently located, came to visit us at the JEN headquarters in Tokyo. It turns out that they woke up at 5 in the morning, cooked 7.5kg (!) 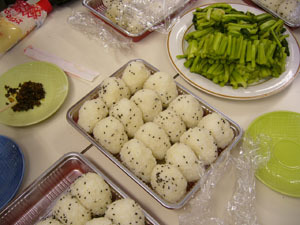 of rice, and made it into more than 100 onigiris, just for us JEN staff. On top of all the onigiri, they brought us dishes of wild vegetables and Japanese pickles, all made from ingredients taken from the hills of Iketani and Iriyama. Everything was delicious-what seemed like an infinite amount of food vanished down the staff's bellies in no time. A big thank you for all who made today such a wonderful day! On October 23 2004, the Great Chu-Etsu Earthquake devastated Niigata prefecture. To respond to the emergency, JEN has been conducting earthquake disaster reconstruction and regional development projects in the city of Tokamachi. In the winter, JEN recruits snow removal volunteers. Between spring and autumn, JEN sends farm work volunteers to Tokamachi. 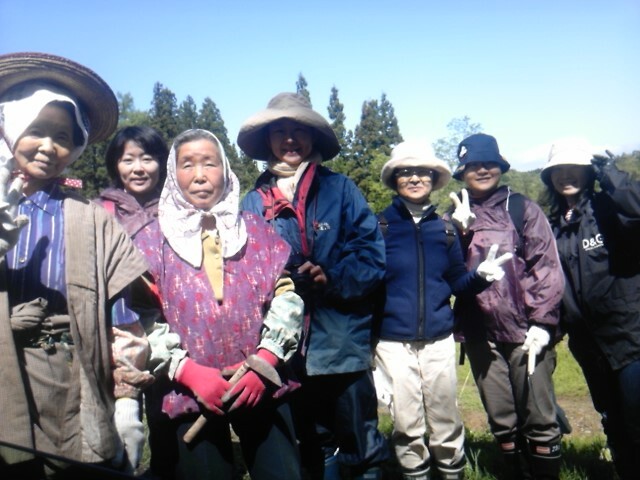 JEN has been sending farm work volunteers to Iketani settlement in Tokamachi. Iketani is a beautiful rice terrace village, but has a serious depopulation problem. 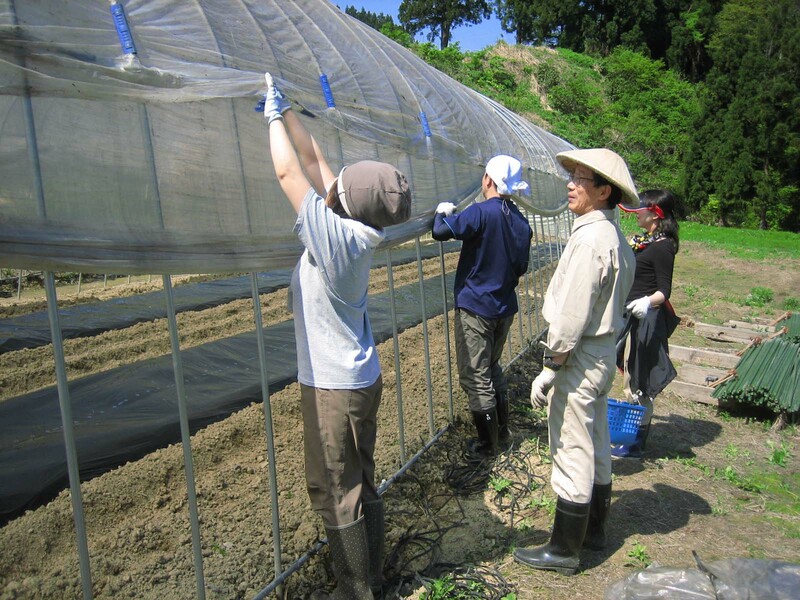 The assistance of farm work by volunteers from all over Japan will help, not only reconstruct earthquake damages, but also revitalize the region. Volunteers will stay at the Iketani branch school, which was repaired in 2005 by volunteers and residents, after having been closed for 20 years. Iketani is beautiful and a region full of nature、Join us and have a great experience! ※Please bear the cost of the traffic expenses to the field. ※If traveling by car, please park in the parking place of west or east exit and come to the Hokuhoku Line’s Gate. ※The times may be changed. 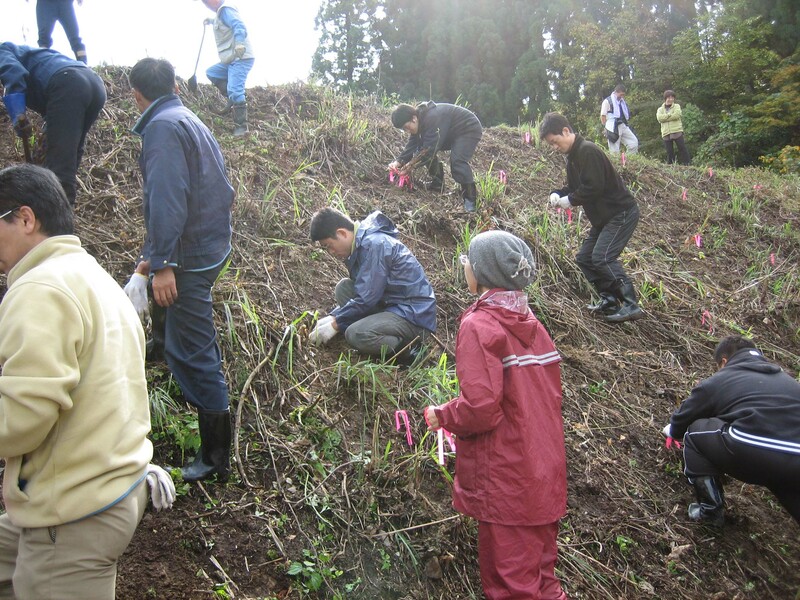 ■Activities：Clean up Iketani branch school, repair the farm road, plant and harvest rice, cut grass, prepare and participate in events like harvest festival, develop relationships with local residents. Communal lodging at Iketani branch school. ※The activities may be changed, according to the weather or other conditions. ■What to bring： Sleeping bag、dustcloth (for cleaning up branch school)、cotton gloves（non-slippery）、long boots (for rice-farming work)、long sleeve shirt、cap、mask (for dusting)、rain coat、etc. ※Please ask if you need boots and sleeping bag rental. ■How to Apply：Please contact us via telephone or Email. We will provide you with an application form. 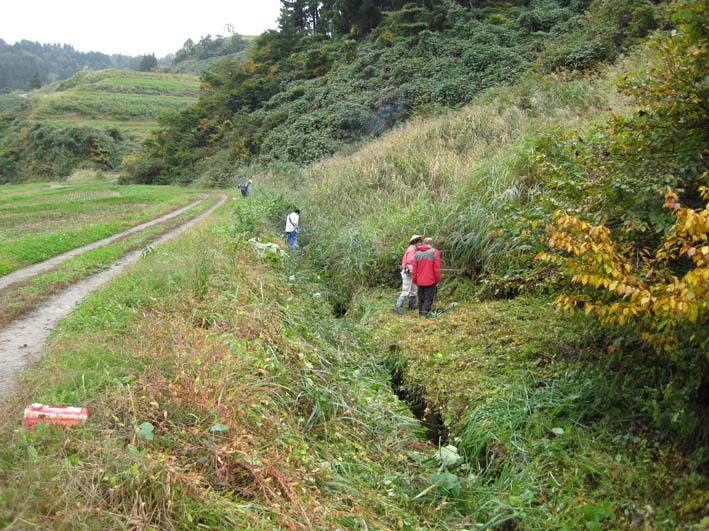 ※Niigata project is operated by Niigata cooperation of Tokamachi-shi regional development executive committee. The last of the “JEN Snowbusters 2006” was carried out on February 17-19, with a total of 11 participants including seven high school students. 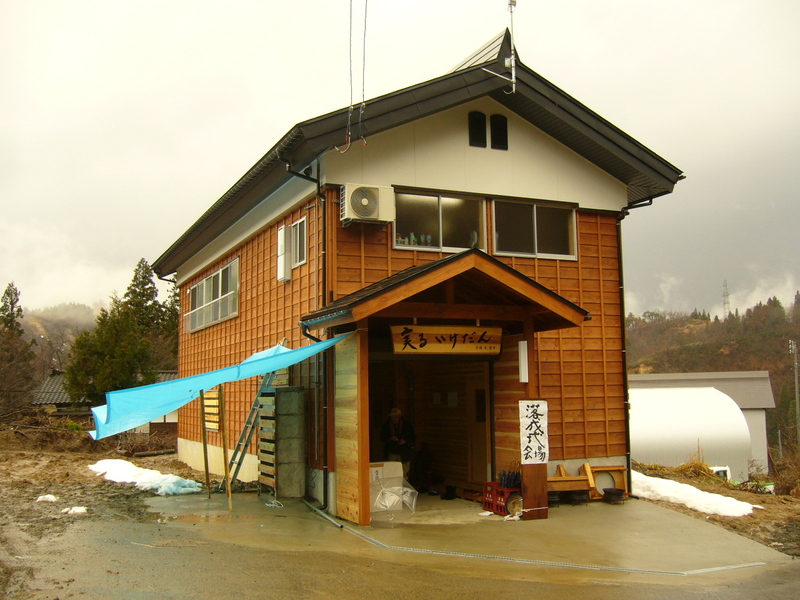 On the first day and a half, we went to the Kotsunagi district, a place within the Tokamachi area known for particularly heavy snow. There we cleared snow from a shrine and three houses. The Kotsunagi district, which was close to the epicenter, suffered especially extensive damage within the Tokamachi area. Since the soil foundation of the district has all but collapsed, it is said that the buildings will never be safely livable again. Therefore, many of the houses have been or will be taken down. Furniture that will not fit into the temporary housings however, have been left inside the houses lived in prior to the quake, and thus clearing snow from residential areas holds a vital meaning for the residents. We have heard that due to this year’s heavier than average snowfall, there have already been seven snow clearing sessions. Even the snow around their own houses proved almost too much for the residents to clear; the district shrine was simply unmanageable. Centering around the seven high school students and their teacher, the “snowbusters” were able to clear snow from the shrine as well as two of the resident’s houses, and their work was greatly appreciated by the local people. The high school students still seemed to have, unbelievably, energy leftover after the snow clearing had been completed, and enjoyed engaging in a wild snow fight. Last of all, we would like to express our heartfelt thanks to all volunteers, the members of the Tokamachi Regional Development Committee, the residents’ association of the Nakajo temporary housings, and the Tokamachi Welfare Council.